Note: for clarity, all quotes are in blue italics on this page. The project was designed to provide more background on the details of Bowditch’s work and its underlying philosophy. Bowditch’s work was much more than just the steps taken to produce the single state map on consumption. Bowditch’s success as a medical geographer is a classic example of how a geographer combines topography, climatology, hydrology, pedology, land use and people into a single disease ecology study. Although probably very familiar with the animalcule theory, Bowditch had no idea that consumption would later be found to be due to a microorganism, in particular a microscopic fungus. Yet his method for researching the behaviors of consumption represent a detailed method of analysis that is focused on some of the most important features required for a living pathogen to survive in any given area. Moisture, the presence of soil capable of percolation, the lack of aridity for regions due to their topographic and geology more than their latitude status were very important indicators of where consumption would be most abundant. Bowditch’s only fault was the lack of knowledge that this disease was one of many due to yet another type of “animalcule” yet to be uncovered–the microscopic fungal cells of mycobacterium responsible for this disease. A few more years would have to pass before bacteria could be shown to be the cause for many diseases. Meanwhile, medical geographers and cartographers did everything they could to try to map and define the suspected cases for numerous endemic and epidemic diseases. For this review of Bowditch’s work, the following sections are provided. These sections were developed for review as short chapters. The first of Henry Ingersoll Bowditch’s maps on consumption is a classic. We often come upon it when we begin to learn about disease mapping and medical cartography. But why did Bowditch produce this map? What was he trying to explain? The common explanation about this map is that Bowditch was using it to relate soils to the incidence and prevalance of tuberculosis, then referred to as consumption. This explanation is true in part, although the causes for consumption Bowditch was trying to illustrate with maps involved much more than just soil structure, form and chemistry. Soil did play an important role in making some areas more susceptible to consumption than others, but other variations in the natural setting still had to be considered such as climate, weather, wind, humidity, topography, geology, the types of water sources out there, as many different features out there as there were ways of studying and observing the local environment. All of these according to Bowditch played a role in establishing the healthiness of a region. Each element of nature played its own role in making it easier or harder for consumption to develop in some settings. In the end, Bowditch decided that it was the dryness of a region that was the most important factor in determining the susceptibility of local inhabitants to this disease. Dryness prevented consumption from developing, and for those who had consumption, dryness assisted them in overcoming this debilitating disease. To identify dryness or the lack of retained moisture for a given setting, one had to look at all of the local physical features. Numerous features prevented dryness and made a given area susceptible to consumption. The ability of soil to hold or store water due to its layers and particle forms, the ability of topography to cause the rapid drain of a saturated soil, the ability of wind to carry away evaporating water, the ability of the sun to modify the local humidity and improve local evaporability due to specific landform features, and the absence or presence of certain unhealthy settings like a detritus rich edge or a lake or swamp, all of these made it possible for a given place to be healthy or become unhealthy. They tested the ability of humans to endure their given living environments, and brought the ideas of evolution and natural selection into the human household and living environment. 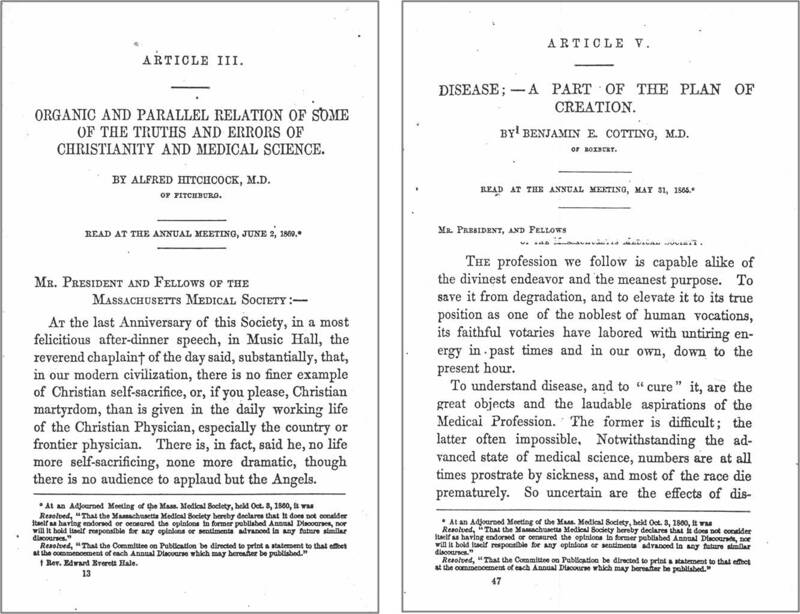 This view of disease for which environment played a key role had its links to the popularization of Darwinianism during the early to mid-1800s. As a replacement for Lamarckianism, the natural selection theory took the formerly famous philosophy that stated people were able to adapt to a new environment in a generation or two, and turned it topsy turvy, telling us that sometimes people could not adapt, and when they couldn’t, the end result was possible death or extinction. Both the Lamarckian and Darwinian evolutionary theories played important roles in the development of the various medical geography theories for disease that were developed from about 1780 to 1880. Like the Lamarckian philosophy of 1790 to 1830 or 1845, the Darwinian philosophy of man, disease and adaptation became the most important ideology for mankind to live by, religious or not. Adding to the Darwinian argument in the natural sciences was the matching natural philosophy argument of the chruch and religious culture. The natural philosophy belief stated that religion and Natural Laws had to be paid attention to. When trying to determine or predict one’s ability to survive unhealthy environments and unhealthy environmental changes, God’s Will and Intentions, be they direct or indirect, had to be taken into account whenever one’s personal or family-wide tendency to become diseased had any relationship to these survival-related features. This was one of the arguments that Bowditch was facing when he tried to understand the natural philosophy of consumption. In his work, Bowditch provides his readers with insights into this very popular dilemma in medicine at the time. He essentially asks: was man’s ability to survive within a given region pre-determined? Was man’s inability to adapt a misunderstanding of this fate too heavily promoted by Lamarckians? Therefore, one other benefit of reviewing Bowditch’s work in this kind of detail is that he engaged in this work because he was asking himself the very same philosophical questions of researchers then, as well as today. With this work he reveals to us both his logical nature as a scientist and physician, and his internal metaphysical beliefs with regard to God and religion. As Bowditch reveals to us in this work, he believed in both God and in natural selection, with natural selection a result of Divine Plan, not a plan design to punish us for making mistakes in life, but rather a plan designed to award us for adhering to the rules of life set before us. In Bowditch’s work, he refers to this rule that he covers in his as the “Law of Consumption”. Bowditch’s belief in such natural laws related to human health system was typical for the non-Catholic religions then popular, such as Protestant, Methodist and Lutheran. For this reason, it didn’t really matter what religion Bowditch was devoted to. What did matter was that during this time of his study, Bowditch was a disease and public health expert, who used this method of interpreting disease and natural history as the means to develop a new theory regarding the cause for consumption, and along the way, make several very important contributions to medicine and public health. 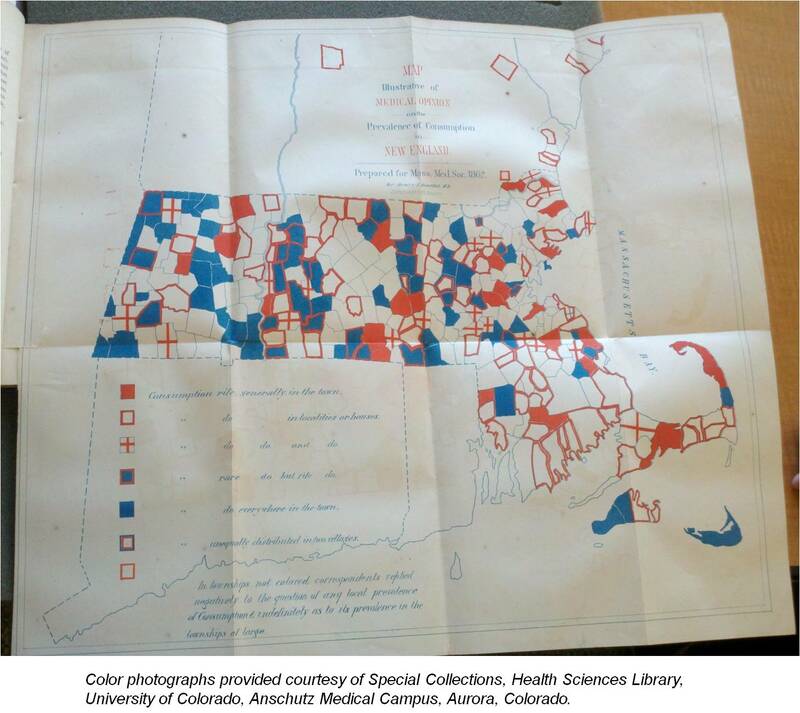 Bowditch’s map of Consumption in the state of Massachusetts probably rates fourth or fifth in terms of the knowledge of its existence by historical medical geographers when compared with other famous disease maps. It comes fairly close in popularity and knowledge with the map produced by Valentine Seaman of several Yellow Fever cases introduced by ships in the New York-New Jersey harbors during the very early 1800s. This fame is perhaps surpassed by the global disease maps produced by Alexander Keith Johnston and Adolph Muhry, and most certainly by the famous epidemiological map produced by John Snow. There were two types of disease maps out there in the medical world during this period of its history. There were what we refer to today as the standard epidemiological maps, in which we try to illustrate some cause and effect relationship between health, disease, people and places, by demonstrating the spatial distribution of each of the cases of disease under investigation, in relation to each and every possible cause for the disease. This was done by measuring the locations of each of these causes and effects, over space and occasionally time, and then without much math trying to draw some conclusions about the given relationships that apparently existed between these various measures. There were also broad area maps used to characterize certain disease types and unknowingly at times tell us where these diseases tend to prevail. The broad area maps serve as what are today referred to as environmental and ecological maps. They are used to define why a disease tends to persist in one area while being totally absent from another of similar placement or form on the globe. These broad area maps are used to define disease prone regions and disease susceptible regions, and during the 1800s, often tried to demonstrate a link between certain types of diseases and such things as wind patterns, water flow activities and of course human transportation behaviors. It was this cause and effect relationship for diseases and people that was the primary reason disease maps were first published during the 1800s. 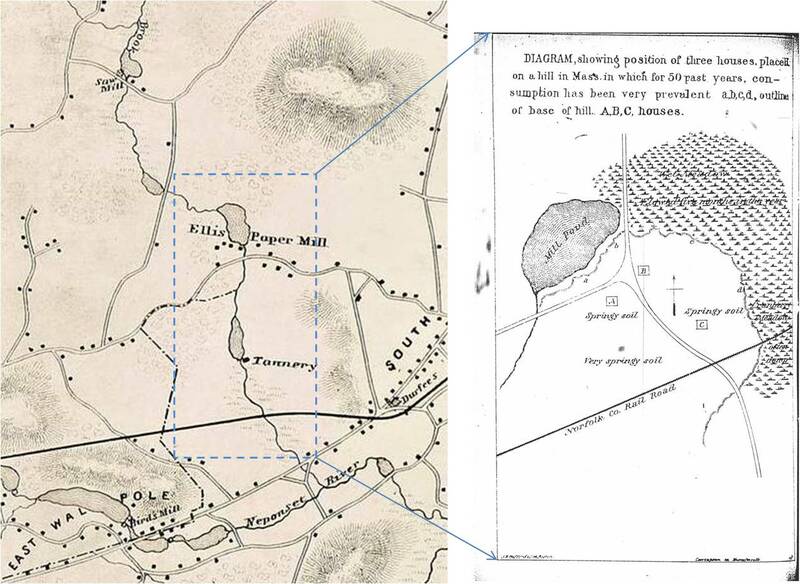 In some military settings during the 1700s, these maps told you where it was safe to set up camp and where not to set up camp due to the local marshlands depicted, which in turn implied places where fevers could prevail and epidemics of dysentery could erupt. During the nature of disease theory in medicine during the very early 1800s, these maps helped physicians come to a better understanding of their explanations for disease at the time, telling them how the initiation of a local disease may occur, and whether or not this was a result of some natural events in nature and the environment or a product merely of place. With Valentine Seaman’s map of the yellow fever cases for example, patients fallen victim to this disease were mapped relative to their surrounding natural settings and the ship they had just departed from. The attempt here made by Seaman was to show that this fever was a possible consequence of of something carried by those afflicted with the fever, and not necessarily to any surrounding environmental settings, due to the presence of other individuals residing next to their route of travel to their place of stay. 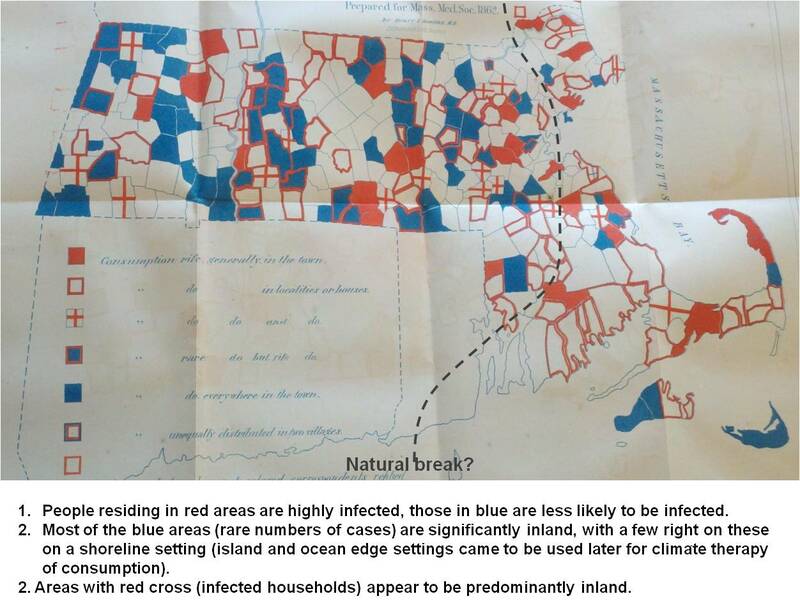 One of the most interesting things about disease maps for this time must have been just how satisfying they are to plan and then develop. Maps enable a researcher to compile various findings, enabling him/her to make better sense of these observations. When a researcher is puzzled about the potential cause for a disease or health change, placing all of these notes on a single piece of paper spatially often assists in developing important epidemiological insights and finding important answers to many of your research questions. For medical climatologists, for example, there was the direction of winds and local changes in barometric pressures and precipitation that could be mapped and related to disease. For the miasmatists and effluvialists, it was the location of swamps and water edges and the places where decaying vegetable debris prevailed in quantity and odor. For phlogistians, the locations of new and unresearched places bearing a special element or chemical of nature awaiting discovery had to be mapped. For medical topographers, the placement of mountains, geological formations and different soil types were investigated. Finally, for contagionists, there was the location that the first person developed the disease, along with his or her association with possible causes in the surrounding environment, and his/her location relative to all others who caught it from the original source. Each one of these reasons for mapping disease was fairly common for the early 1800s. One century later, these interests were lost as the attention to pathogenesis suddenly focused on just a single association, the pathogenic organism and the afflicted individuals. By the 1860s, as a result of the two preceding cholera epidemic periods (1831-2, 1849-53) and the numerous yellow fever periods in American epidemic history, physician were ready to map out disease as a phenomenon of nature and people. It was often some unusual natural events that individuals felt were responsible for epidemic periods without much of direct association with recurring natural events. The very unusual and non-cyclic epidemics were often associated with rare events like changes in in solar or meteoric activity, the eruption of volcanoes, changes in prevailing winds and seasonal temperature patterns, the onset of a heavy rainy period. With maps, doctors could focus on real places and disease in an attempt to identify possible geographic causes. By far one of the most common associations made with disease and place was the character of places relative to local water surfaces. Depending upon your perspective on things, this could mean that there were physical geographical features that could be related to disease, or you could blame it on the kinds of people inhabiting these settings. In the Midwest for example, poorer communities, like the newly arrived German and Irish immigrants tended to live next to marshy, or otherwise less healthy riverside places. The blame for the epidemics of cholera went to those houses with the most fatalities. As another example, in William Farr’s review of cholera ( Farr W. Report on the mortality of cholera in England, 1848–49. London: W. Clowes, 1852. Farr W. Influence of elevation on the fatality of cholera. J Statist Soc Lond 1852; 15: 155–83. But see also Eyler JM. William Farr on the cholera: the sanitarian’s disease theory and the statistician’s method. 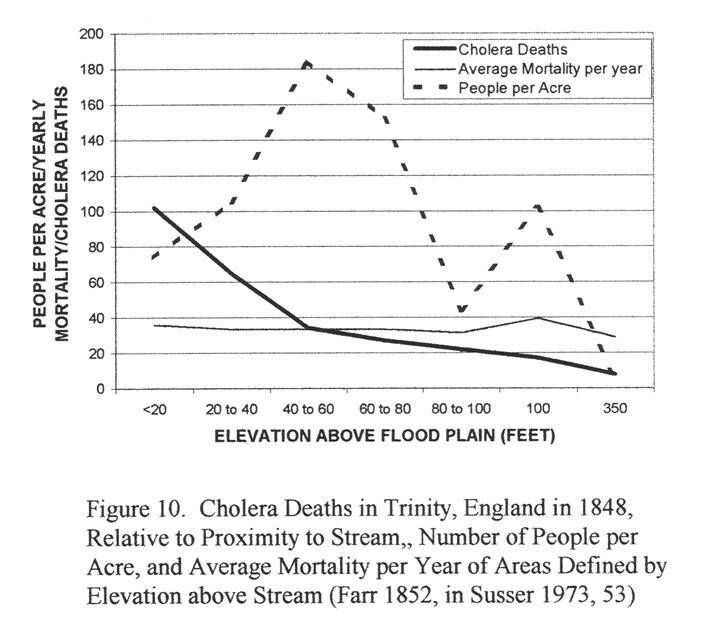 J Hist Med 1973; 28: 79–100), Farr found that elevation above the local water surface had a direct association with the numbers of cholera deaths in England, and not only population density. In a unique study of cholera in Illinois, the author attributed this disease to the combination of rain, rising water, local latrine locations, and the flow of detritus taking place within the subterranean flood plain waters close to the edge of the river [add citation]. In the alluvial settings of the shores of the California bay settings, it was the combination of landform, gravel bed type and the types of plants that formed most of the detritus that were considered to be the cause [add citation]. It wasn’t until the late 1800s, some time during the 1870s and 1880s, that maps became very popular for depicting the exact routes of diffusion of diseases. These migration routes were based on conclusions drawn about human migration patterns. Asiatic cholera, for example, was one of the most common diseases to be mapped this way. These maps began to first appear in large numbers following the 1831 epidemic of cholera as it became global over the next two years. Early maps were for specific parts of the world, usually the author’s homeland. The details of these maps provide us with better insights into the small scale local details that the large maps tend to be lacking. From a Russian map of the cholera epidemic spread in 1832, across the Ural Mountains, we learn that elevation and climate are not as much a hindrance to cholera diffusion as in other parts of the country; this was due to its diffusion over these hundreds of miles by way of direct contact between victims and previously unexposed soldiers; it was the continuous people-to-people transfer of the disease that kept this epidemic alive. Similar diffusion maps for disease were produced for the 1849-1853 epidemics of this disease, at county, national and international levels. But it wasn’t until the later half of the century that the production of these maps became essential and were considered the best way to define a potential disease cause. The best example of this investigative research using maps was produced by a number of government workers and physicians responsible for monitoring the cholera epidemic history and state of the world, and then publishing their results in 1867 (this story is saved for another page). Unlike cholera and yellow fever, consumption was a disease that was much harder to map. It lacked the uniqueness of having a beginning and need to an epidemic period like the cholera had. It lacked the short term lifespan of the epidemic, the short life of its pathogen, and the obvious beginning and end of the epidemic period usually attached to epidemic diseases. Endemic diseases were always there, and during the periods when they were not so prevalent, communities were less certain about when the problem would return. Consumption always seemed to be around in settings which had no immediate association with each other. Like Farr’s cholera victims in England, the rich houses situated up the hill and away from the riveredge were just as likely to experience the disease as the poor families living next to the shoreline of the Thames River. Like the immigrants residing in Ohio next to the pestilential rivers, the German families that tended to close their windows each time an epidemic hit, remaining inside these close quarters, unknowingly made it easier for every one in that house to become afflicted with the grandmother’s consumption, unlike the members of the Irish families in a similar setting travelling from one household to the next in spite of these deaths. As for the Russian soldiers making their way across the Ural Mountains, should someone become afflicted with consumption along the way (display early symptoms), this disease would starts as acough, proceed to a dark sputum, but then only last him for a week or two of the trip; once he reached the very high elevations and cold temperatures in order to make it through to the other side of the mountains, this consumption mysteriously resolve on its own (go into remission as we today call this). This major epidemiological differences between endemic consumption and epidemics like cholera meant there had to be another theory or cause out there for this disease. The dilemma in the public mind throughout the 1800s was the unanswerable question–what is the cause for consumption? A common human behavior attributed to this worrysome state is the tendency for people to want to turn towards some religious cause. This was a common public reaction throughout the the Renassiance and Colonial years. It was also a recurring theme brought up each time yellow fever epidemics returned to North America during the late 18th and early 19th centuries. It was the reason asiatic cholera was referred to as the black plague (black, due to black rings formed under the eyes). Along with hundred of other natural history related causes that scientists had come up with during the mid to late 1800s, religion and God were blamed for much the same problems involving the Asiatic cholera once it came to North America. But in equal numbers were the theories for these diseases based on every aspect of the local natural history that could be studied, contemplated and used to develop the next new theory. It was not unusual for some of the themes upon which these theories were based to recur. The cosmos was often blamed for these recurring diseases patterns, explained as the result of a passing comet, a meteorite impact, a sunspot cycle, or an eclipse of the planets, sun, earth and moon. Natural signs and sources of unharnessable energy were often blamed as well, ranging from the changes in atmosphere and temperatures linked to volcanic activity, hurricanes and tornadoes, to the effects of earthquakes and severe droughts upon local water bodies and wildlife. Other less severe natural events were also to blame at times, like thunderstorms, hail storms or the occasional tsunami. Even the very local conditions were often blamed for a given endemic region, such as a severely decaying marshland, a smelly river or lake edge, the piles of decaying carcasses and no longer useful animal parts left behind by a butcher or tanner. In spite of all these very well known unsanitary places we happen upon in life, there were still some people who lacked the opportunity to expose themselves to these suspected causes for disease. 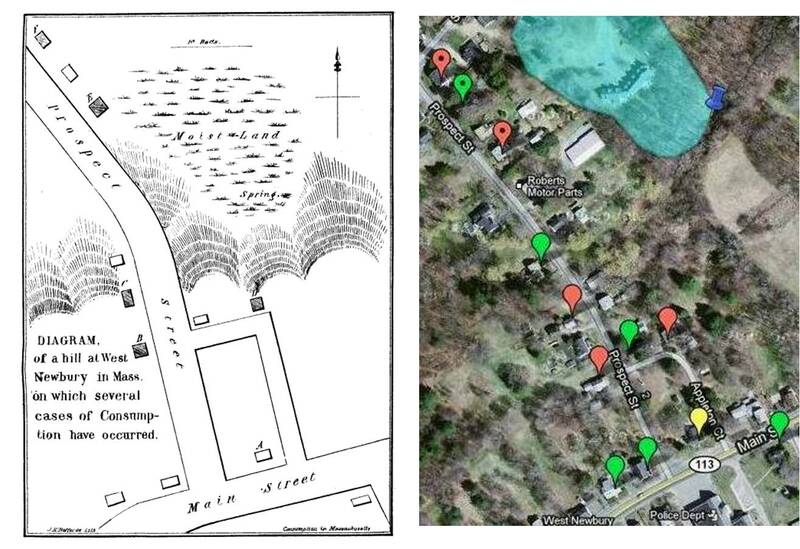 For these individuals, medical topographers and climatologists searched high and low for any possible cause unique to their given home and neighborhood setting. Not a single case existed for which some type of cause could be found and published in the medical journals or as part of some medical book designed for use in the household or by some medical school. The most confusing part of this philosophy came when multiple diseases were attributed to multiple causes of the above geographical nature. This allowed for explanations to be given whenever one couldn’t easily be found. In this way the causes for cholera were identical to the causes for yellow fever, and unfortunately at times the causes for consumption. Religiophiles were skeptics when it came to most of these explanations. The cause for disease according to their philosophy was one of singleness and unity–a choice made by a Higher Power. With cholera, for example, the claim that people were the cause for their own demise made a lot of sense. For many local cholera epidemics, the initiating factors and cases were related to some sociocultural aspect, such as living within a low economic community setting, in shacks and boardhomes, or in cramped quarters with friends and relatives also not trusted by the community. To the Lamarckian old-timers out there, the argument was these immigrants were not yet adapted to life in the new world, unlike themselves and their previous family members who moved to North America several generations earlier. To the most hard-nosed of outspoken religious leaders, the prevailing Catastrophic theories of recent years was still around, and helped promote this ideology–the fact that God could in a moment wipe out tens of thousands to millions of life forms and form fossil beds was His clue to us humans that the same fate could become ours as well. Such would be a the case if we weren’t careful, a very understandable explanation for those most recent diseases occuring in increasing numbers, killing more people each time through. In spite of this prevailing problem of relating disease to culture, ethnicity, poverty and heritage, deaths due to the diseases within poorer communities were never quite as isolated as medical topographers and social leaders imagined them to be. Poverty was rarely a major factor in defining whether or not a household got consumption. There was a tendency for consumption to hit multiple members of a family, making other neighbors suspect that these deaths had something to do with a higher power, since the lives of their own household were spared. The local religious leaders liked to claim that eliminating an entire family from the town, due to the nature of its influences upon an otherwise healthy society, was a result of His Will and Intention. It was not a punishment of just children for partaking in unacceptible games and other forms of recreation, or a member of the family who was unfaithful or guilty of onanism, or an elder tied to tightly to the bottle and too loosely to the church. These deaths due to consumption were a consequence of poor parenting, too much childbirthing and family growth, unethical behaviors, poor religious practices. Whenever an entire family with so many children had their lives taken by this new plague, the religiously faithful neighbors who were spared could only draw one conclusion–these deaths were due to God’s Hands. Bowditch very much disagreed with this logic. Although devoted to his church, he was not willing to take the same course that past arguments took in this debate about the social cleansing some claimed was taking place. Bowditch used his maps to make this point., and then develop his own theory as to the natural causes for consumption. The problem now was explaining this theory so that both sides of the religious debate could understand and accept what he was saying. If we take a retrospective view of the theories about consumption, versus yellow fever, versus cholera, as well as other diseases that were once very limited in their geographic distribution like malaria, amoebic dysentery, west nile fever, and knowing their causes in thye modern sense, it is hard to imagine there was a time when the same natural mechanisms involving the abiotic land surface could be responsible for so many different disease types, so many representations of endemic and epidemic illnesses. During the early 1800s, many of the diagnosis flowcharts put out there for differentiating disease were not focused on disease at all, just the symptomatology. In this way all fevers were united as a single disease modality, with each fever bearing a different set of precursors and requirements for the illness to become continuous, intermittent, remittent, ague, yellow, spotted or nervous in character. Likewise the diarrhea and dysentery were often strongly correlated in the medical books, with no knowledge of the differences between the causes for mild cases like plain hydragogical diarrhea (produced by salts like magnesium citrate) versus moderately severe like dysentery, to the more fatal versions of longterm diarrhea such as cholera morbus, cholera infantile, and asiatic cholera. This meant that various other factors were useful in trying to differentiate diseases. To the medical cartographer, place had everything to do with these illnesses, and along with place came the related climate and weather, the varying atmospheric conditions like temperature and humidity, as well as the variations in topography possibly linked to the cause. Even though the most geographically or climatic and topographically linked disease for the early 19th and late 18th century was consumption or tuberculosis, mostly considered to be an endemic disease, the diseases to be mapped were the more understandable distributions of the two epidemic diseases–yellow fever and cholera. Both had specific climate driven patterns affiliated with the epidemicity. A study of the influences of weather patterns and topography on these spread patterns helped define their path of diffusion around the world. The lessons physicians learned from cholera (and to a much lesser extent yellow fever) could then be transferred to other disease patterns in need of such studies. In 1856, once the cholera recurrance had stopped, doctors were able to get back to the regular business at hand–dealing with the local endemic disease patterns. Consumption was one of the first of these diseases to be effectively mapped at the very local level with as much detail and local application as the infamous cholera map produced by Snow. The disease consumption (tuberculosis) has very different biological and ecological limits and barriers to its natural environment and human ecological needs and requirements. The most common cause of this disease is a fungus (Mycobacterium tuberculosis), one species in a Kingdom of life forms that is very much known for its ability to withstand environmental and ecological pressures, and resilience when it comes to adapting to changes made in these natural settings. 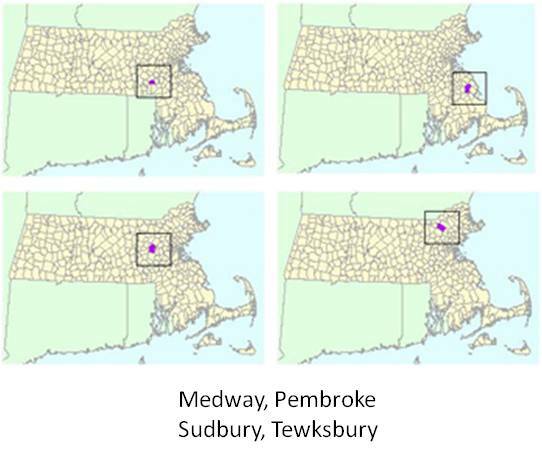 The spatial requirements in a modern sense are very complex, but during the first decades of work performed by early medical geographers trying to understand its spatial needs , it was found that certain features did tend to display a tendency to favor whether or not tuberculosis could prevail within a given area and population setting. One of the primary features later found to be one of the most limiting factors for determining the mycobacterium’s ability to survive had to do with sunlight and temperatures, followed by land form and quite often climate. It was later found that the sun alone could reduce the problems a person had due to tuberculosis. This discovery gave way to the development of tuberculosis camps in order to treat people with consumption who had full-fledge maturing cases. This was a very important use for the Catskills to just a few during the late 1800s, but to many more by 1910. 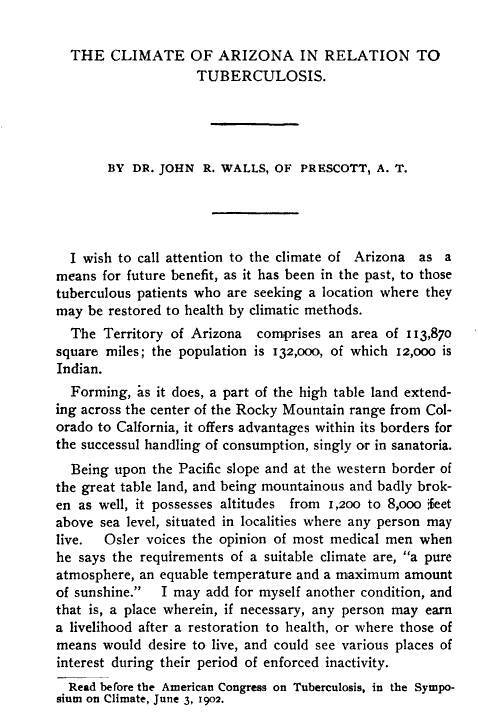 Likewise, a number of Arizona camps were established to provide this form of therapy, where an individual with severe, long-term consumption might have his/her thorax cut open with some sort of fissurotomy to expose the damaged tissues inside to fresh air and light; this enabled the sunlight and air of the high elevation setting to kill off any mycobacterium still residing in what once were fully concealed living quarters. This form of treatment for consumption was obviously for late stage and near fatal forms of the disease, but was very popular for a short while at the turn of the twentieth century. Preceding this unique form of consumption treatment was all the work required to come to the conclusion that these kinds of sanitarium camps were needed. This is where Bowditch’s work comes into play regarding disease mapping. Over a few years time span between 1880 and 1899, a certain amount of bickering was going on between physicians due to new theory of disease that had surfaced–the bacterial theory. Tuberculosis was not the first disease to have its microbial origins defined (fungi are harder to research and test). But it was one of those that did have a cause that could be defined and discovered before the end of the nineteenth century. This period is when the mapping of disease due to topography and climate related pathology histories was replaced by the production of maps focusing more on just disease patterns and migration behaviors in relation to population. Medical geography had turned from a fairly complete natural science based interpretation of disease patterns, into a purely epidemiological form of disease study. The very last rebel to contest these inevitable changes in science and medicine was soil and chemistry specialist and hygienist-based disease researcher Max von Pettenkofer. 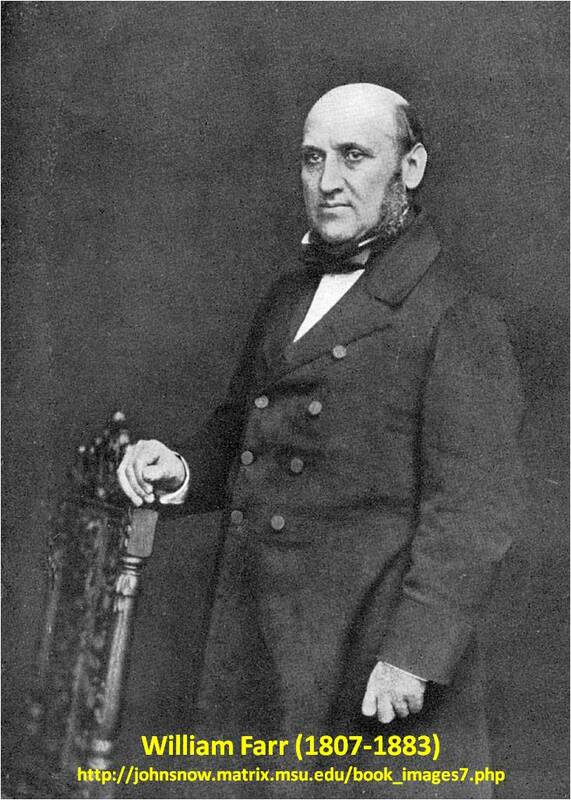 Pettenkofer’s most important immediate predecessor was an individual who helped to him form his philosophy regarding disease, Henry Ingersoll Bowditch. What makes Bowditch’s Consumption Map so famous for this period in disease mapping history is its choropleth nature. A Choropleth type of map is one that defines a certain characteristic of a particular feature in a fashion that includes a ranking or the information that is mapped, and a distinct color pattern designed to display the areas in which a given feature applies. The Choropleth map was unusual to medical geography at the time. Most maps produced for medical geography use were very much like the maps we see today in tropical disease medical journals. They depict the natural and human ecology of a disease relative to spatial features. Whereas medical geography maps are fairly common today, and to some fields a neccessity, the best and most unusual medical maps found in the professionals today are usaully focused on animal borne or vectored disease ecology, with topics like lyme disease, congo fever, hanta virus or ebola. During the 1860s, the main topics in science being related to disease were chemistry and soil, and their relationship to the other natural elements like topography and climate. Since water was a common element in both of these sets of spatial features, water bodies and humidity came to be how these spatial relationships of consumption and area were developed. This merging of philosophies resulted in the famous consumption map for Massachusetts produced by Henry Ingersoll Bowditch. 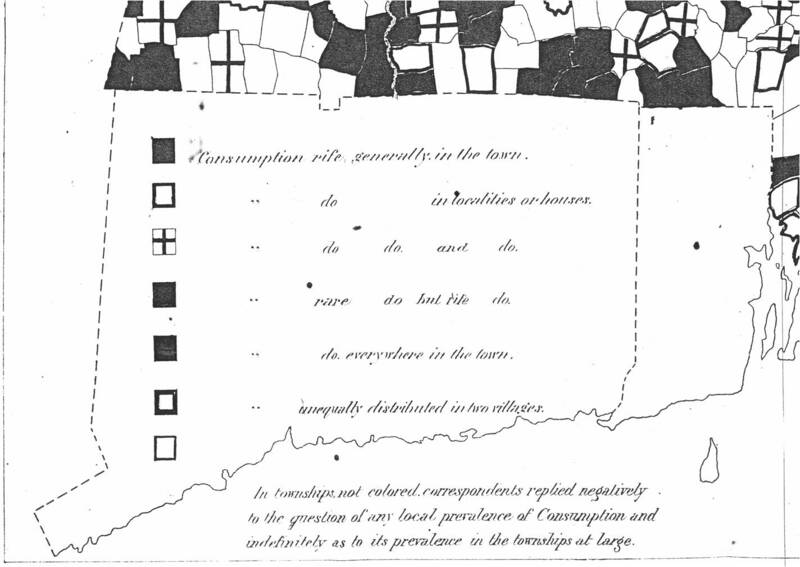 This map was displayed to the State in a presentation given at the 1862 annual meeting for the Massachusetts Medical Society entitled Consumption in New England: or, Locality one of its chief causes. 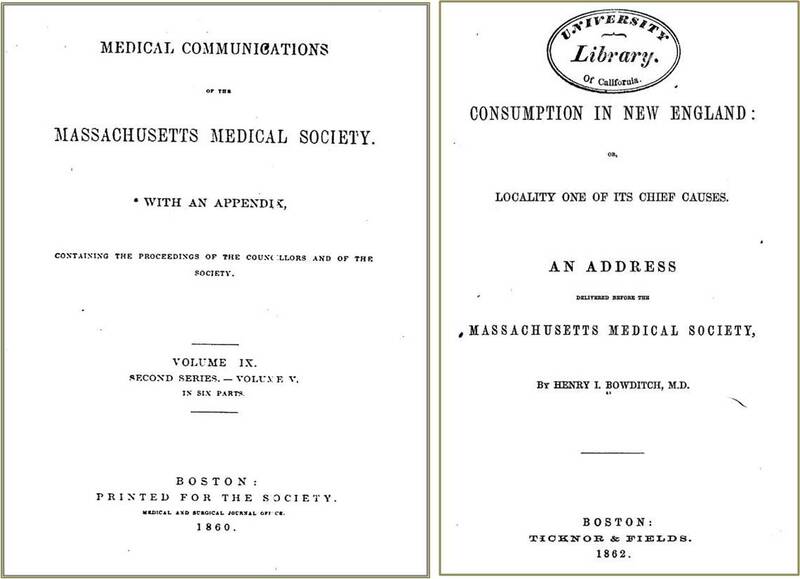 An address delivered before the Massachusetts Medical Society (Ticknor & Fields, Boston, 1862). 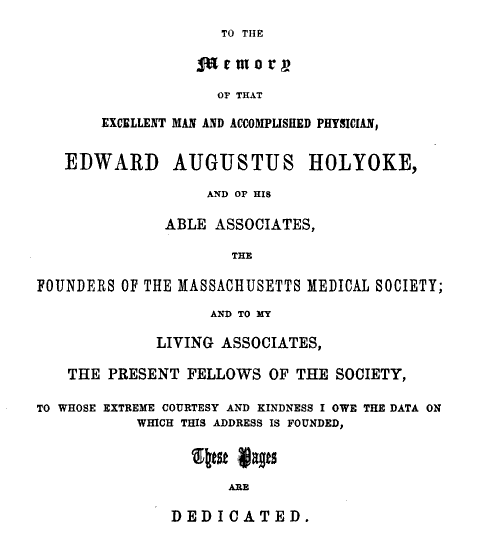 Bowditch dedicated this work to Dr. Edward Augustus Holyoke. There was a lot of heritage attached to Dr. Holyoke’s name for the field of medical topography and climatology. Dr. Holyoke was the son of a minister and was one of the first to propose the notion that the absence or presence of trees had a lot to do with local climate and health. This philosophy made several medical geographers who followed in his footsteps quite famous. One of these followers was Harvard University President and Professor Reverend Samuel Williams (1743-1817) (reviewed on https://brianaltonenmph.com/along with Noah Webster). After his years of service to Harvard (which he left due to some unauthorized expenses), Dr. Williams later became famous for first providing the first detailed map of the state of Vermont. His fame however came to a peak years later when he theorized that global warming was happening, as revealed by the descriptions in the Old Testament. His opposition, Noah Webster, claimed that the earth had both warming and cooling taking place across its surface, behaving differently in differeent regions due to land changes and deforestation. The son of Reverend Edward Holyoke, Senior, Edward Augustus followed in his father’s footsteps by turning medicine into a profession more in agreement with some of the religious teachings. As Lamarckism was being replaced by Darwinism during the mid-1800s, the Natural Selection processes began to take on more meaning, leaving predeterminism and “The Great Primevil Cause” for the complex designs of nature for others to ponder. To some of the scientists like Bowditch, both God’s Cause and Nature’s Cause could exist, an argument which was reaching its peak by the time Bowditch became a physician and began his scientific work as a medical topographer working for the state of Massachusetts. What we really never learn in the discussion about Bowditch are the other maps he produced alongside his famous state choropleth map. These maps were more in alignment with the trends for the time, and depicted a number of studies that Bowditch and others engaged in as medical epidemiologists and topographers trying to develop a better understanding of the possible causes consumption. It is these maps and the related observations on consumption found in Bowditch’s article on Consumption that tell us what kind of medical cartographer he was. Was Bowditch focused on the physical sciences or on the people? Were heredity and place a cause for the deaths of entire families, or something not so much the result of Nature and God? These were some of the main questions and controversies that Bowditch was trying to tackle with this work. This goal he himself expresses in his writings . . .
With this comment it sounds as if Bowditch is stating that God is punishing the people for where they chose to reside. But in fact what Bowditch was stating is that there are some places where people are much healthier residing in, and other places where people were never really fully adapted to or biologically constructed for, so that when they do try to survive in these unhealthy settings they jeopardize their health and their chances for a long life. Bowditch was not as fatalistic about God and nature, or natural selection and death, as most avid church goers were. Bowditch’s work seems to have satisfied all sides religiously, professionally and politically regarding the matter of disease and its cause. For this reason his philosophy was carried on by others for the next decade or two, most of whom were scientists and physicians who later would have to fight for their cause against the new culprits of disease and medicine out there to get them–the contagionists and their bacterial theory. Even then, defeat was not the fate of Bowditch’s work, for this study prepared contagionists and physicians by teaching them how to develop their next plan for treating the cases of fatal consumption–the use of special places not prone to consumption to treat the pulmonary consumption or tuberculosis patient. Thus the growth of sanitariums in the early 20th century. Bowditch described his method for engaging in this study in the Appendix section of his report. He essentially began this work with a survey sent out in January and March of 1854 and February 1858. He sent these surveys to 325 townships in Massachusetts, all of which sent him a reply. Two hundred twelve responded. He used 183 of them, representing approximately 130 locations. To develop his hypothesis as to the cause for consumption, a disease that was endemic to certain regions unlike yellow fever and asiatic cholera, he focused on things that remain constant for a region, such as geology, soil type, topography, vegetations, prevailing climate and precipitations, etc. He then reviewed and compiled his results and presented them to the Massachusetts Medical Society. These findings were later published as a separate document and as a part of the Annual published by this professional group. The following is Bowditch’s description of this survey and analysis process. The survey Bowditch developed consisted of the following cover letter and then a circular with 17 questions. 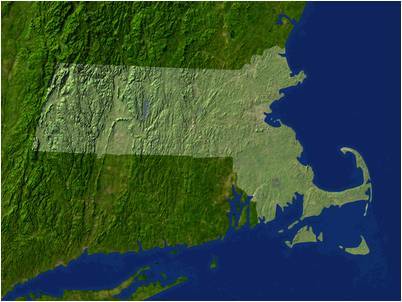 From the above maps we can also see that Bowditch’s efforts encompassed the entire state of Massachusetts and about a dozen places just outside the state boundary. He probably included these out of state locations due to specific questions he had as to cause and effect, his knowledge of someone in that region, his need to have buffers for state edges that he felt were inadequately covered, or his need to add a few more examples of an environment that was poorly covered, like ocean edge areas considered to be “healthy” and “consumption-free” according to some of his writings. Most recently an electronic copy of the original map was provided to me by the librarians at the Anschutz Medical Campus in Aurora, Colorado. (This is the new name for the relocated medical school; some offices remain at its original location in Denver, Colorado). Since this is a rare and highly valued document, it couldn’t leave the viewing room. Therefore, I extend my thanks to The Special Collections Librarian at Anschutz for this opportunity. 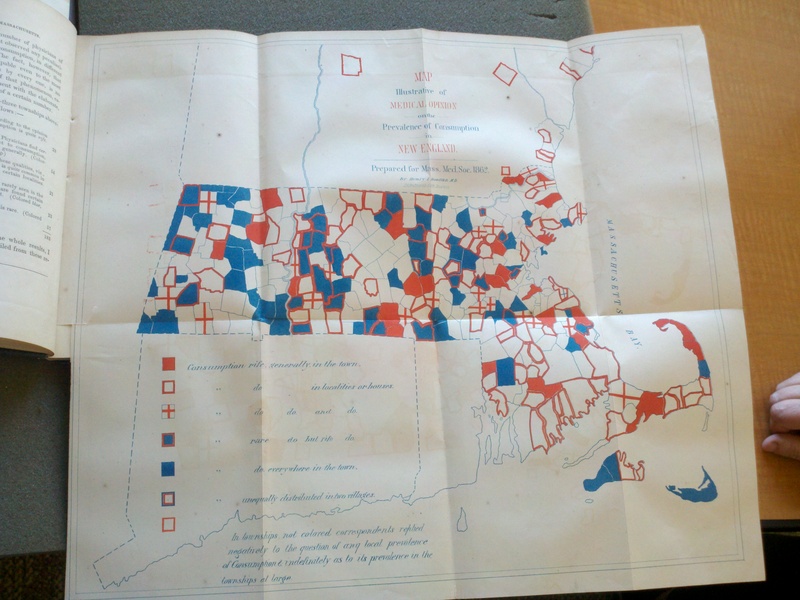 A population density map, 1860 census map, or soil map would be interesting to see overlain with this data. I’ll leave most of the interpretation of this map up to the readers. (I am working on the east coast, my GIS is on the west coast; please let me know if any of you successfully duplicate this in GIS. For those who want to download the full image, go to the beginning of the appendix). 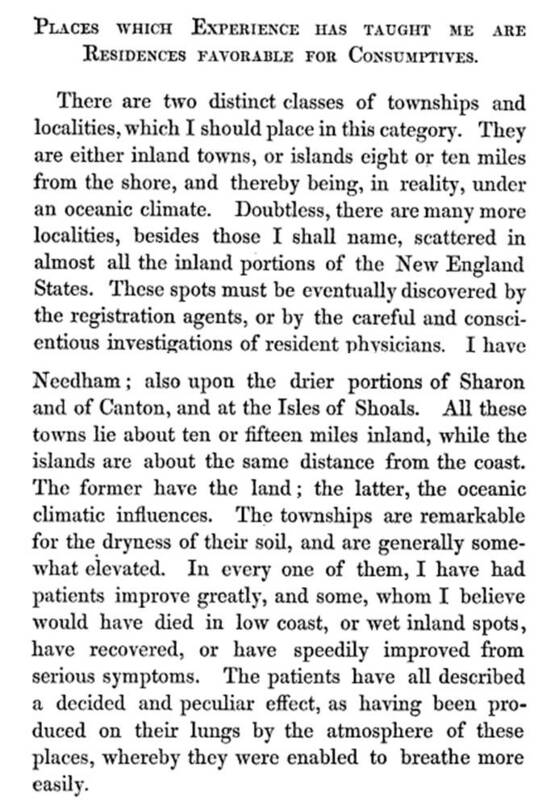 Just 3 years before Bowditch gave his speech on the geography of consumption, another medical geographer working for the state of Massachusetts, Dr. Josiah Curtis (ref: Mass. 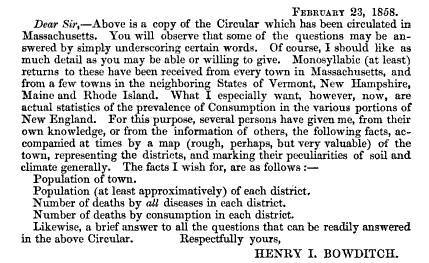 State Registration, 1859, p. 17, as cited and footnoted by Bowditch) claimed that for every 2 individuals who died in Britain due to consumption, there were 3 deaths that occured in Massachusetts. (fn, p. 11, Bowditch, 1862). During Holyoke’s time, Primal Law referred to the Book of Christ. It was a reference to the laws of the Creator which Jesus taught his listeners to observe and respect. The meaning of primal law was about to undergo the first change required for this religious interpretation of the phrase to become modified into a scientific line of reasoning. Lamarck had done much to improve man’s interpretation of nature by the dawn of the 19th century. Man was now more able to understand the adaptation processes that occur in nature, the various stresses and natural elements and events we have to live with on a daily basis, so much as to define our fate and chances for survival in some circumstances. About 30 years later Darwin turned this Lamarckian philosophy and tradition into a speech of the past, stating that there was a natural process by which the strong survive and the weak perish. This meant that those who were best fit biologically and physiologically (and ultimately genetically in terms of breeding), were those who would survive a natural event that could make the others ill. The effects this philosophy had on society in general came to a peak just before Bowditch published this work. As noted in his writings, people were considering the option of moving to parts of the world where their physique would improve their chances for survival through the prevention of these terrible diseases. This is one of the chief reasons medical cartographers-geographers like Adolph Muhry and Alexander Keith Johnston produced their global maps of disease. By producing his maps, Bowditch was telling his readers, and the locals indirectly, that they didn’t have to move completely out of this region. They only needed to identify the healthy places to live and the unhealthy places to stay away from. The previous methods attempted to reduce the problems due to these diseases were beginning to seem ineffective. These were such changes in lifestyle and keeping cleaner living space and work space, and wearing the right apparel to avoid exposure to too many of the elements responsible for disease (the wool industry was developed for this reason, see notes on the Livingstons and Congressman Bartow White for much more on this). In spite of all of these preventive practices, people were still coming down with consumption, and entire families were often being afflicted. The facts I shall lay before you, and the principles I believe fairly deducible therefrom, involve the question of the proof or otherwise of the existence of a Great Primal Law in the Development of Consumption in Massachusetts, and probably New England, and possibly of a still wider scope, not hitherto distinctly recognized. Attention to this law by our ancestors, and by ourselves at the present hour, would, as I believe, have saved, and would still be saving, hecatombs of human beings that are now annually sacrificed. Holding most firmly to this opinion, you will readily understand my eager anxiety to convince not only you, my associates and efficient collaborators in this investigation, but, through you, the whole community, of its vital importance to the present and still more to future generations in New England, and possibly other parts of our country. 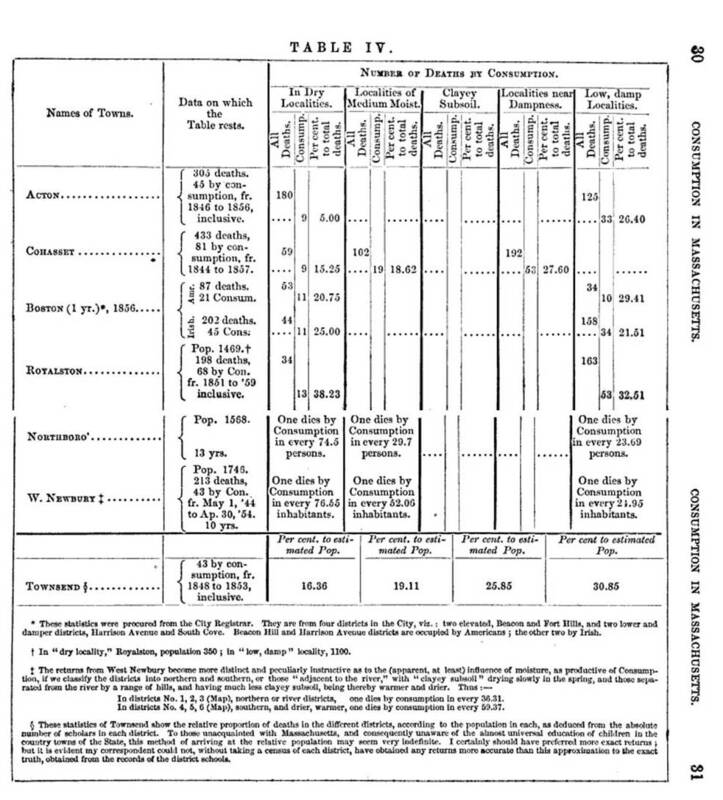 To support his claims, Bowditch collected the information on various consumption cases and produced the following table to make his point. Bowditch had developed a detailed understanding of the consumption and the local topography. He used these observations to then develop his own theory as to the topography of this disease. He found soil to be the most important element. Until now, the focus had been on water, humidity and temperature and the spread of miasma, and the gases or fumes eminated by decaying vegetative matter in unhealthy swamps, lakes and riversides. Bowditch added soil to this picture, claiming that once water was in soil, and the nature of that soil changed due to this addition of water, the substances contained in the soil reacted with the water, and any gaseous materials stored between the grains of soil, any gaseous materials produced and emitted by soil, all of these together made certain soil types within certain topographic settings highly infectious or pathogenic. Man was not meant to live on these soils and in these highly infectious places. First. A residence on or near a damp soil, whether that dampness be inherent in the soil itself, or caused by percolation from adjacent ponds, rivers, meadows, marshes or springy soils, is one of the primal causes of consumption in Massachusetts, probably in New England, and possibly in other portions of the globe. Second. Consumption can be checked in its career, and possibly, nay probably, prevented in some instances, by attention to this law. This was Bowditch’s Law of Consumption. According to Bowditch this was a “Natural Law” just as much as any other law that existed out there for the universe, such as the law of gravity, the law of light, the law of sound, the law of natural selection. 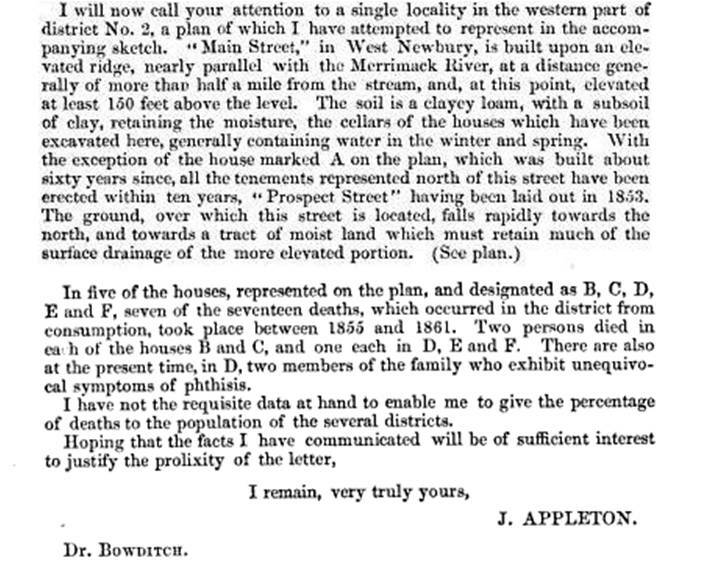 Bowditch developed this version of the natural philosophy of disease through his own meditations with the numerous notes he took on local disease, as well as all the responses he was getting to his statewide survey. Quite an accomplishment for its time, the majority of Bowditch’s earliest observations about disease and topography were from about 1850 to 1860, with most of these observations related first to the cholera epidemic years of 1849 to 1853/4. This period of cholera study was followed by a drop in cholera events and a return to the more typical endemic disease patterns prevail in his day to day practices as a physician . 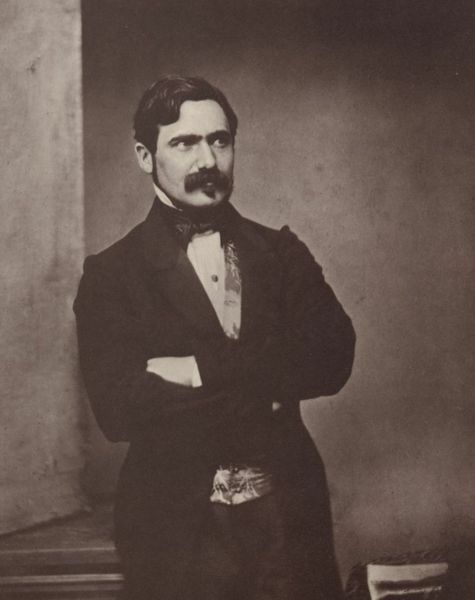 From 1856 to 1860, Bowditch had a fairly ongoing opportunity without much interference to develop his theory regarding an endemic disease like consumption regarding its geographic placement and diffusion behaviors. It was during this time that he drew most of his conclusions about consumption. Fortunately for him, the next cholera epidemic wouldn’t strike the United States until several years after he completed his dissertation on this disease philosophy in 1861/2; the asiatic cholera came back in 1866). 1st Consumption is not, as some writers have contended, endemic equally in every part of New England; but there are some localities where it is very rife, and others where it is vastly less destructive than in the State at large. 2d. There is a law, hitherto scarcely noticed, or but vaguely hinted at by one or two individual writers, but (as I believe) never proved until now, which is one of the main causes, if not the sole cause, of this unequal topographical distribution of consumption in New England. 3d. This law is intimately connected with, and apparently dependent on, the humidity of the soils, on or near which stand the towns, villages, or even single houses, where consumption prevails. 4th. 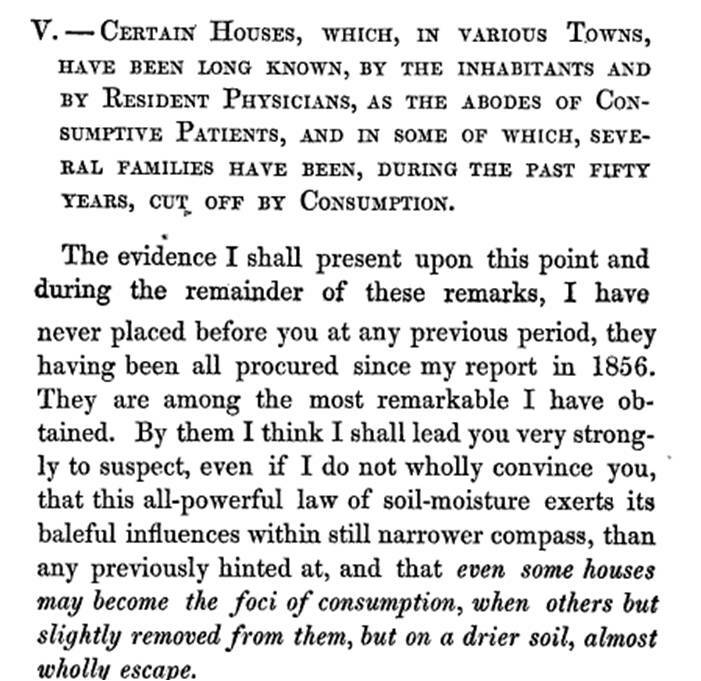 The existence of this law of soil-moisture, as one of the prime causes of consumption in New England, can be proved, as I think, by several lines of argument, resting on actual facts obtained either from public or private records, statistical data, or the opinions of physicians, practising medicine in various parts of New England. He then went on to relate these to his observations in the following table, based on the replies to his survey from his correspondents. The soil that was required for consumption to develop had this special relationship with moisture and water. For water to be present in the soil, space must be available within the rock and soil bed. Certain soils carry more water than others. Those soils rich in clay can expand and contract quite aggressively due to changes in humidity, rainfall and upwelling or overflowing water edges and bodies. A stream that stretches out across its flood plain, a marsh that stores more water in the spring due to snow melt and heavy rains, a lake edge that backs up onto one’s farmlands or property edge, all have an ability to harbor something capable of causing disease. Bowditch and others really didn’t know what this substance was, or even where it was in these layers of water saturating the soil, along with the silt, debris and decaying matter that left behind once the water receded back to its normal state. Variable climate was a factor when it assisted somehow in these processes, and perhaps facilitated the transfer of a disease causing material from one disease ridden spot to another non-pathogenic place or piece of property. But also note what little role the winds played in all of this. This mode of disease development and transfer is very different from the disease theories used to define yellow fever and cholera (both mosquito born with wind as a major environmental factor according to those who wrote about it). Unknowingly, Bowditch had deduced a biological differenec between the two ecological forms of disease, without ever knowing their “animalcule” like nature of origin, the first microorganismal, one bacterial and one viral, and the other fungal. By them I think I shall lead you very strongly to suspect, even if I do not wholly convince you, that this all-powerful law of soil-moisture exerts its baleful influences within still narrower compass, than any previously hinted at, and that even some houses may become the foci of consumption, when others but slightly removed from them, but on a drier soil, almost wholly escape. To be safe from consumption, this meant you had to choose your property carefully and wisely, or jeopardize losing your life along with all of the lives of your fellow family members. According to this theory, soil could be open and hollow, able to store and keep water, even for exceptionally long times, but as long as this soil was kept dry, there was no way for consumption to erupt. The Mill Pond map illustrated above resembles many of the maps of disease dating back to about 1750. Notice how just a few features are needed by the cartographer to make his point. The main areas displayed are households, water bodies, transportation routes, and when necessary something to define the borders for a disease location or potentially endemic region. Swamps, streams, and rivers are mapped, with lakes differentiated by the texture of their polygon fill. Areal soil characteristics for this map are described just using text. Any additional text descriptions needed are provided on the map itself, in this case at the top. The point, line and area features that are discussed have their identifiers in the legend on top, and use distinct lettering or numbering systems. A crossline-arrow version of the compass is displayed. The entire map, including its descriptive text, has a boundary line, inside which the cartographer’s and printers’ names appear along the bottom inner edge of the map. After a considerable amount of search of place names in Massachusetts, a possible location for the area on this map was located using Google Map and a number of other historical maps of Massachusetts available for review on the web. 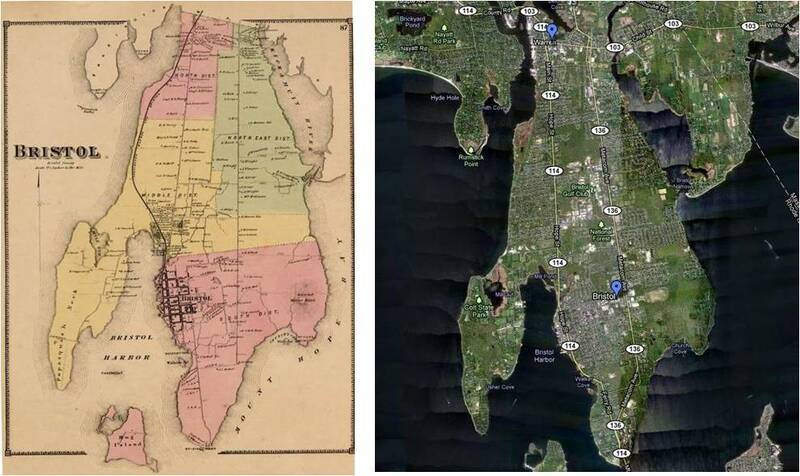 Tracing this map on Google Map was difficult due to significant changes in land use patterns over the past 150 years. The primary lead to locating this site appeared in the text of the article, a statement claiming this information was provided to Bowditch by a physician in Franklin. 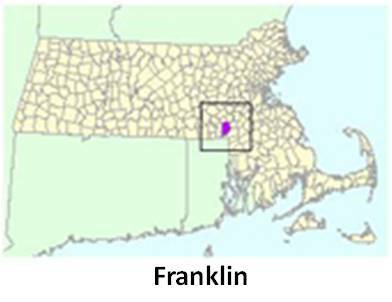 This meant that the location had to be fairly close to Franklin, a town located westsouthwest of Boston, close to the border of Rhode Island. 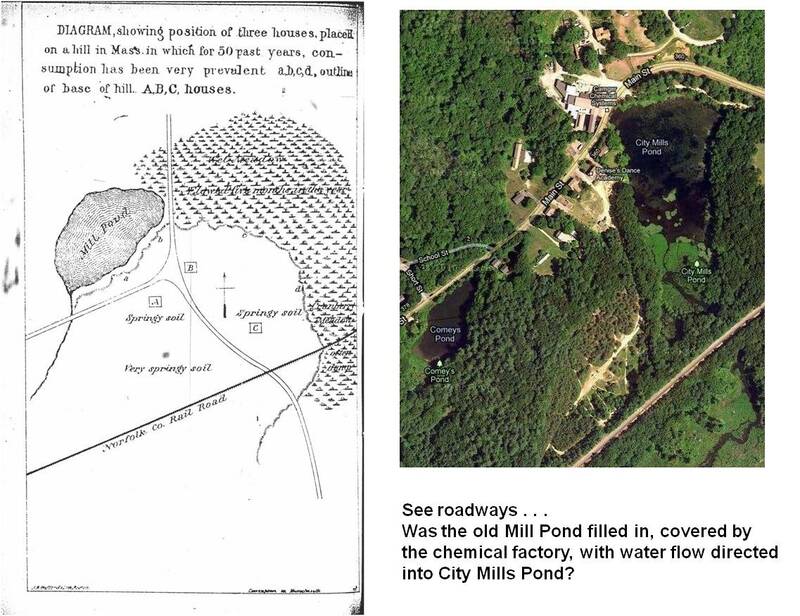 The problem then became finding a water body with the same name on the current maps–Mill Pond it ends up is a very common name. The presence of tracks labelled “Norfolk Co. Railroad” helped significantly in this process. This railway was operating during the time that Bowditch’s map was produced and was still present on the modern maps. 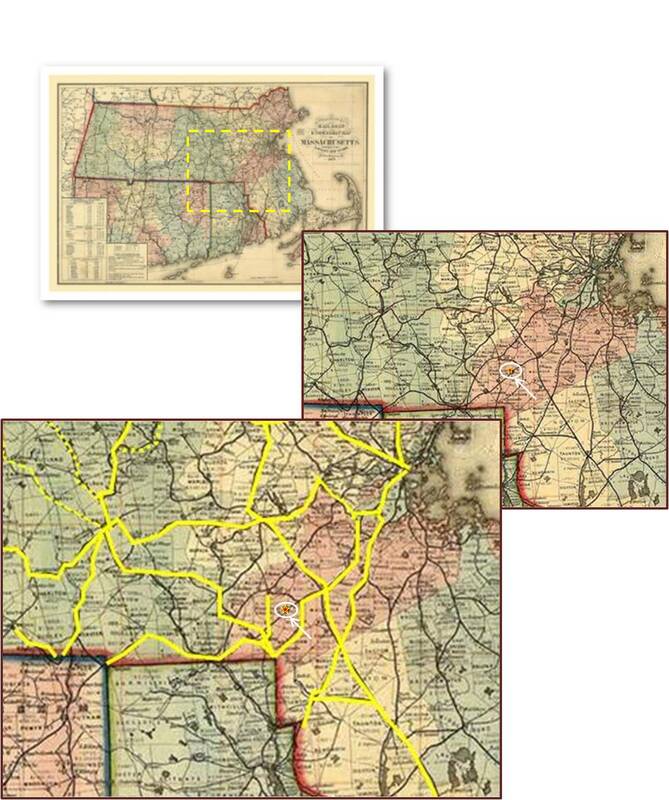 To understand the history of the railroad, with the goal of defining where the railroad was that Bowditch referred to, a railroad map for Massachusetts with railways laid around 1862 to 1870 had to be located. The following hand-drawn rendering of a railroad map was found, which referred to railroads in existence around 1870. [Source: Lewis Walter, ed. Hon. Edward Appleton, Railway Commissioner. 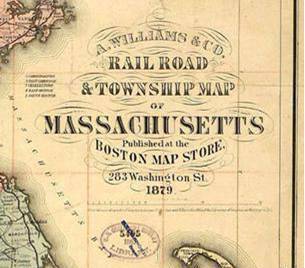 History of the Railways of Massachusetts. 1871. Bulletin No. 1. January 1952. The Railroad Enthusiasts, Inc. Accessed at http://www.catskillarchive.com/rrextra/abnere1.html] The Franklin area is in the red rectangle; other areas with rails heading somewhat westsouthwest to eastnortheast were also identified for later comparison with more detailed maps. This was then related to a significantly later map, which although it provided more details, now had too many railways. From this perspective, a water body with a name like Mill Pond was located, but its shape did not conform. Shapes change over time, but the other nonconformities were the roadway with the three-way intersection south of the pond, and the large marshlands east of the pond and roads. The light brown country road-like path could be the older road on Bowditch’s map, but this entire region has changed its uses several generations over. It appears as though very little of the original topography is present any more, as well as the houses noted on Bowditch’s map–assuming this is the correct location. 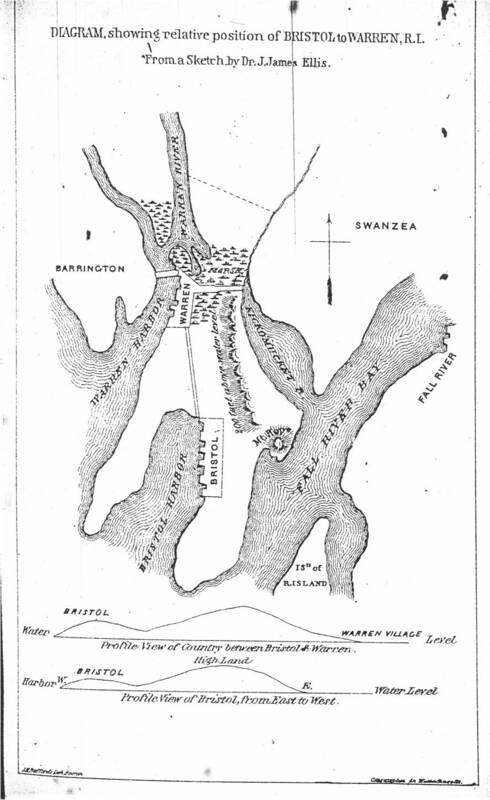 Nevertheless, this map provided the detail needed to make the points noted by Bowditch in his text. (This text is quoted fully in the next section.) Referring to this location centuries later, it is difficult trying to place this map on the overall state map. These are fairly unique features for a region, especially with the railroad noted in relation to the roadways intersection and the lake-stream pattern. 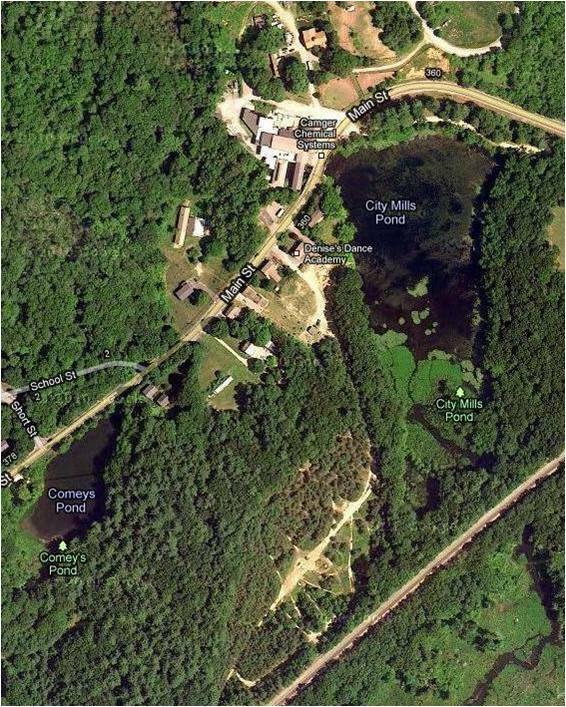 One would hope the lake name–Mill pond–would help in this matter. Only one Mill Pond was identified as having the possible characteristics needed, minus the T-intersection in the road just east of the pond. Since the railways are fairly limited for this time in history, this is probably the region depicted by Bowditch’s map, with the roadways simply a design of the past, their absence the result of reclaimed open space and possible recreation lands. All of this was strongly supported by the Massachusetts State Archives map on this railroad soon after it was built, a small section of which depicted Ellis’ Paper Mill, with the pond also a little off from Bowditch’s map, as if it was migrating southward. (See map at beginning of this section.) My certainty with this proposed site location is therefore 100%. Bowditch’s text accompanying this map follows. Avoiding carefully all leading questions, and especially any allusion to the vague notions in regard to the influence of soil I then held, I desired him to make a rough drawing of the position of the houses, and to tell me the characters of the soil, on which they were built, and of the vicinity. I give a copy of that drawing in the subjoined diagram. The houses A,B,C could not be situated in a position more favorable for an ” experimentum crucis” of this law, supposing it to exist. Exposed to the north and east, their foundations rest on a soil permeated with water; the base of the hill, on which they stand, being skirted by meadow and pond, so that every north-east wind comes freighted with moisture upon them. Even the warm and genial sun strikes the hill at an angle, and as it were slides over rather than lights upon it, not penetrating, as when the rays strike at right angles to the surface of the soil. Listen to the tale told by these tenements. In one (A), formerly resided a woman who had been born on the estate. * [FN on bottom of page: * She had five brothers or sisters, all of whom removed from the homestead, and no consumption appeared among them.] She married, and had five children. The husband and all but one of the children sickened and died of consumption. The one surviving child became very feeble, took alarm, suspected the locality, moved away to what he deemed a more healthy location, recovered his health, and is now enjoying a green, healthy old age of upwards of 70 years. Thus much for the history of this house, previous to the present occupants taking possession of it. These present occupants are not as healthy as farmers and their families usually are. The father has had haemoptysis several times. The daughter has pains in her back, shoulder and sides of chest, and is under medical care One son is like this sister. One son is healthy. The second house, B. Parents and grandparents healthy. Parents have lived here twenty years. Eldest daughter bled — left home and gained in health; returned and died of consumption, October, 1855. Second daughter always at home; died of consumption in 1853. Third daughter has cough, is feeble, and unable to attend school in consequence; is, in the opinion of her physician, a doomed girl, to die of consumption. Fourth daughter, aged 22, has pains in her side; works irregularly; her physician is apprehensive of her. A son had cough at the old homestead; he left and has improved his health. Second son, 18 years old, with depressed chest; weakly; left home and became better. On returning home, he became worse, and observed that, from some cause, he was not so well, felt less buoyant at home than in Vermont. Third son, 8 years old; a pale, sickly child. Present occupants, less healthy than other families in different parts of the town. Father, rheumatic; mother, healthy; one daughter died of consumption, one of scrofula; a son became deaf at eighteen or twenty years of age. What think you of the illustration’? Look distinctly at the facts. Of 14 grandparents and parents, 12 were said to have been healthy. Of the remaining 2, 1 has had haemoptysis; 1 is rheumatic. Of 21 children, only 2 have been healthy. Of the remaining 19, 9 have died of consumption; 2 of scrofula; 7 are sickly and weak, or evidently affected with pulmonary disease; 1 is deaf. Why are so many sick? Why so many dead ? Why cannot the children live well at their own homes? I attribute it to the location. If you had had half the evidence I have now given to prove that a damp soil is one of the great causes of consumption in Massachusetts, and it had been applicable to diseases of an intermittent type — fever and ague, for example — you would have had no doubt about the question, but would have instantly declared the tenements unhealthy. But you doubt, perhaps, in regard to consumption, because it is not one of the medical dogmas of the times that consumption has any local origin, of such a nature as, I think, I have exhibited to you. 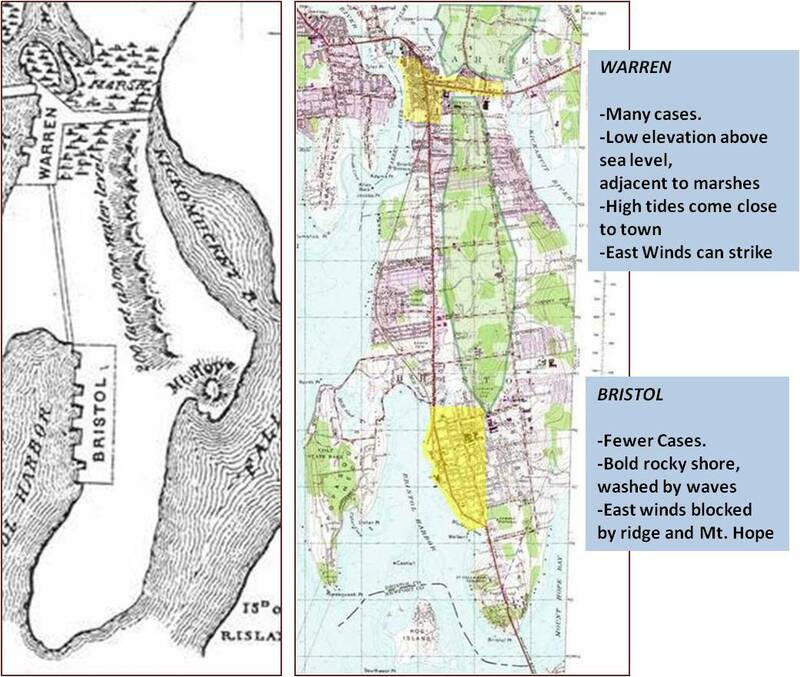 This Warren and Bristol map was much easier to validate. It was provided to Bowditch by one of his respondents from Rhode Island and served as a part of the reply sent to Bowditch in response to his survey. This physician lived down in the large bay area of lower Rhode Island in and around Providence. The question both he and Bowditch were posing at the time was: if soil is so heavily involved with the pathogenetic process, then how would the topography and land forms of an oceanic and bayport shoreline setting fit into this theory? 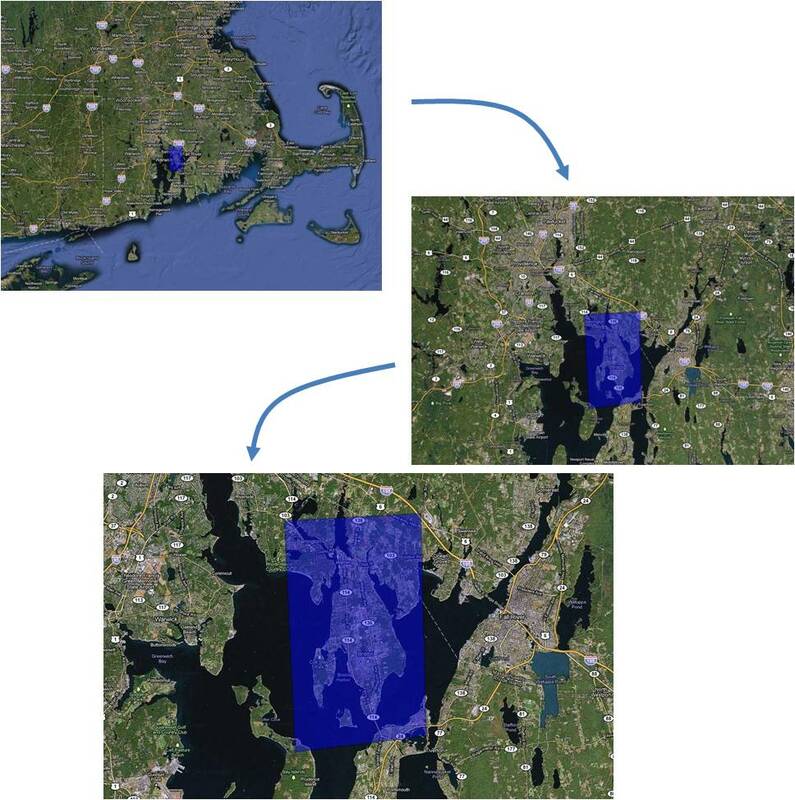 [Above paragraph requoted and sectioned] Dr. Ellis, of Bristol, Rhode Island, has noticed that few persons are affected with consumption in Bristol, compared with the number found in Warren, a few miles distant. Bristol stands on a bold, rocky shore, washed by the waves of a bay, opening upon the Atlantic. We can also relate these observations to a modern map of the area, demonsgtrating the contemporary urban locations and major roadways in relation to the other landform features just defined. Contour lines are also provided on this map of the area. The greener areas are low-lying naturally vegetated settings, which in the middle of this peninsula are wetlands-like . In this case it is the inland nature of Warren that Bowditch is trying to relate to Consumption. Details on the soil differences between these two regions are not immediately available for this review. 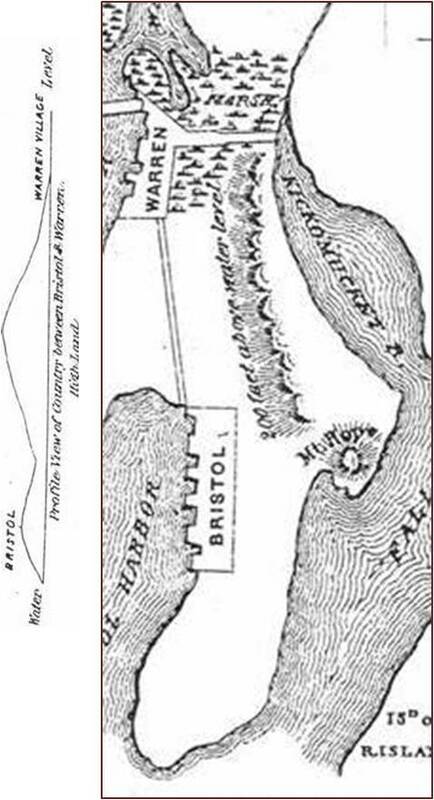 Topographically speaking, Bristol sets on a raised mixture of main land and gravel remains left by a glacial period thousand of years earlier. To the pedologist of 1850, this would make the soil appear very spatious or airy, with the space needed to store water. The higher elevation allows for a drier soil to be produced due to normal percolation patterns in these gravelly, sandy terrain settings. The lowlands to the north suffers from both lack of elevation, and the tendency for vegetative matter to build up rather extensively in some parts of the marshlands settings. Stagnated water and the winds only add to this pathogenetic activity according to Bowditch’s theory for consumption. This theory would have easily been contested by other medical topographers and climatologists however. There was ample evidence for wind-pattern related problems and the possibility of miasmatic causes prevailing due to the local swamps around Warren. The fact that winds and rocky shorelines provide for a cleaner setting, thereby making the shores west of Bristol less likely to result in consumption, makes use of some of this same philosophy, and supports the other fairly common belief beginning to be popular for the time–the possiblity that some oceanside community settings could be very healthy, and useful for treating or preventing consumption in some people. 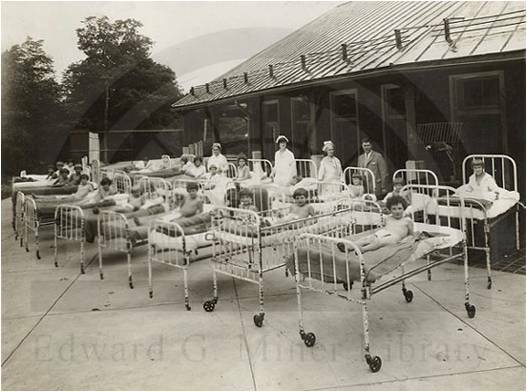 These healthy sites preceded only slightly the later popular movement towards the development and use of sanatorium settings where you could treat your consumption or tuberculosis. Bowditch’s theory is that dryness is the most important preventative factor for consumption. For the Warren area, dryness is prevented by the presence of marhslands and a low elevation with a topography capable of channeling winds across the marshlands towards the township. For the Bristol area, there are two mountain features that prevent this from happening. The soil or land is drier due to its higher elevation above sealevel. As inferred by Bowditch, the rocky shorelines prevent marshlands and small bays from developing, thus there is no still water settling in the region to increase local humidity and/or result in water-saturated soil and sand layers. Due to its rocky coast, exposure, and lack of prevailing ocean wind patterns from the east, Bristol’s shoreline and sandy, gravelly soil are much drier. With the next map on West Newbury, still more detail is provided about Bowditch’s philosophy. 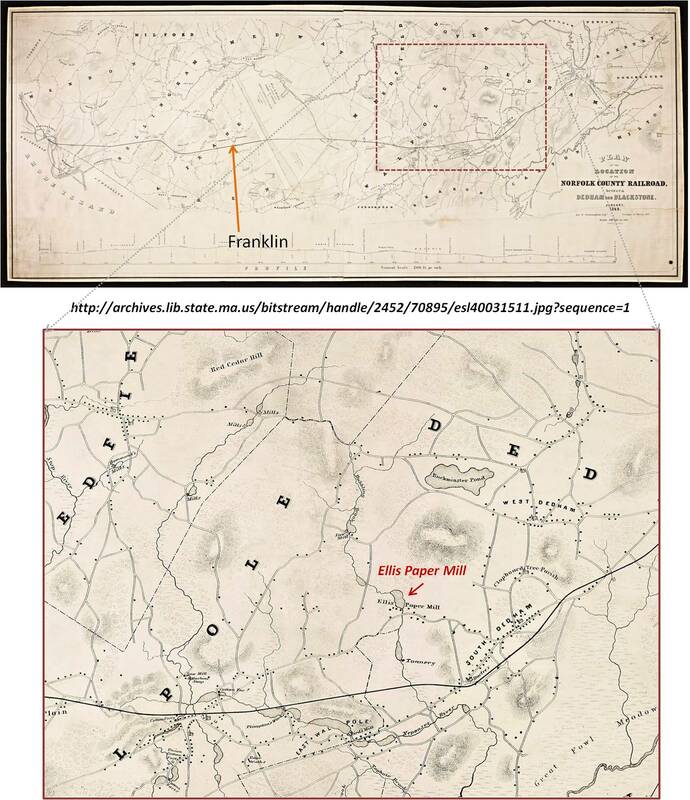 The map relates to a fairly small village in the state back in 1855-1860, as well as today. The similarity of this village on Bowditch’s map to the modern village setting is amazing, and made for easy analysis and review of this part of Bowditch’s argument. Bowditch states in the article that his theory for consumption is two pronged. He believed that consumption was very common in certain inland settings and also common in certain coastal settings. The regions in between he did not define as well, except to state that the inland settings have to exist a significant distance away from the ocean. His explanation is never really clear about the reasons for this, but he eludes to the fact that winds are not a requirement fo rthe disease, and so inland settings have the mountain terrains, hills and ridges required for many of these inland settings to develop special soil and water patterns and thereby adhere to his theoretical requirements. The shoreline settings were also allowed to have consumption, due simply because there were certain shoreline areas where consumption appeared very common. As noted in the last example, this allowed him to assign a duality in the cause-effect relationship, explaining why one oceanside setting would have a lot of patients with consumption whereas another such setting would not. Supporting Bowditch’s claims was a letter sent June 1861. 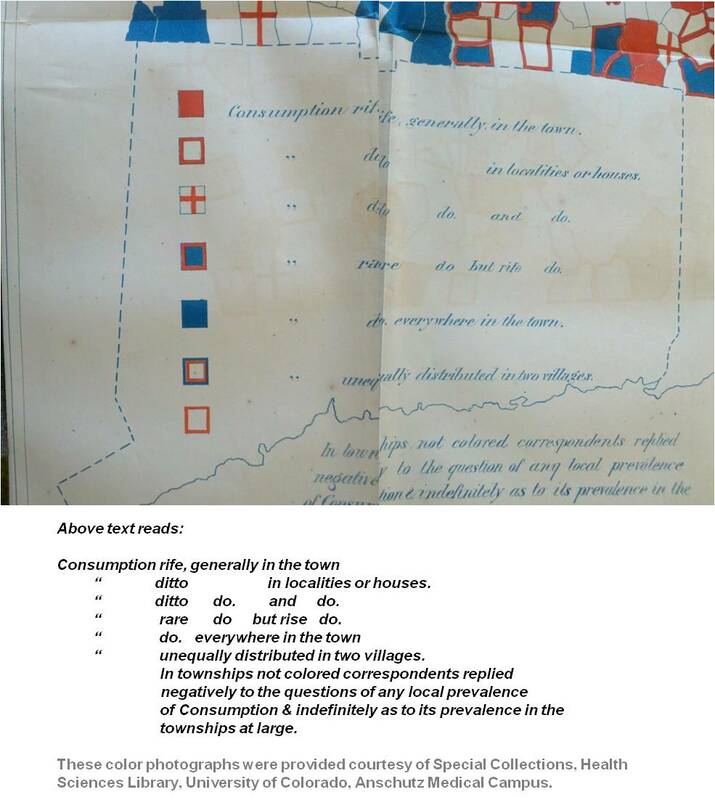 This letter was in response to the survey, and after a brief description of the opinions by Appleton, the author of this letter, a map was provided of Newbury and the following description of the local behavior of consumption. For this West Newbury region, this place was situated well enough inland to not have much possibility of demonstrating a lot of ocean effect. There is the nearby river that could act as some sort of wind chamber at times, thereby demonstrating the effects that wind may have on the infectious nature of the area, but all in all these winds were not the prevailing winds and shoreline winds that so many medical geograpers were trying to link this disease to. This left Bowditch to focus on the local land surface features, its local marshlands and open field settings. Any arid or dry field settings would be non-supporting of consumption, any hot and humid wet lands would be highly infectious. As we get closer to the village setting of West Newbury, more of the environmental features for consumption begin to stand out. In the historical setting, there were no industrial sites located just northeast of the Main and Prospect streets along which the local cases were noted. This was open space with plenty of marshlike conditions (blue area), enough to putrify the air, humidify a living space, and make for periods of very bad health during specific parts of the year. There was also the slight slope to this area detailed above by Appleton, with a forested region to the southeast of the marsh, from where a spring of water flowed and formed a small creek. 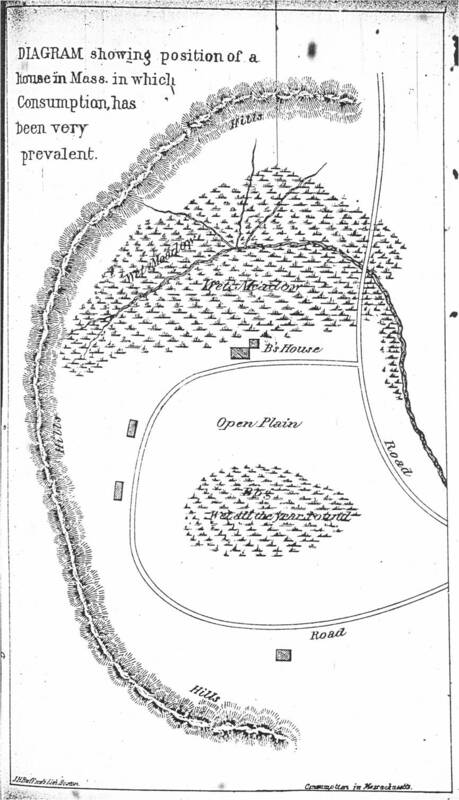 In the map above, the red symbols depict houses where cases were reported, the yellow loner is a place where no cases were found; the green symbols are places for which no history was reported and/or no review was made by Bowditch. 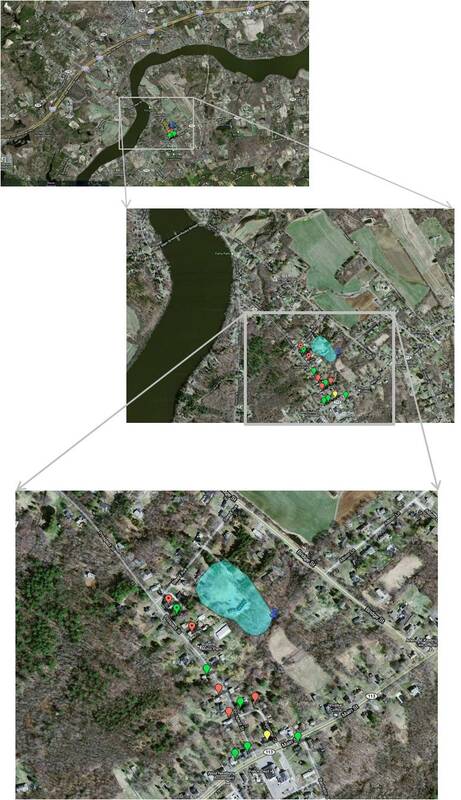 Bowditch used this data to suggest that there was a clustering of cases over by the marshlands. He considered this further support of his claim that water and soil type were important factors in allowing for consumption to develop. The area for which Bowditch drew up for his map was reviewed located using Google Map, and the places for all of Bowditch’s point data could be located. Some of the houses may have been built-up some, and some of the formerly undeveloped land was by now changed significantly due to obvious landfill procedures engaged in for the purposes of industrial use. But overall, this resulted in little modification of the immediately local hydrologic pattern. The downtown portion for this village location appears unchanged more than 150 years after Bowditch produced his map! The slight differences in the borders of the swampy region may be more a transpositional/interpretation error on my behalf than an example of Bowditch’s interpretation of the landscape versus my own. 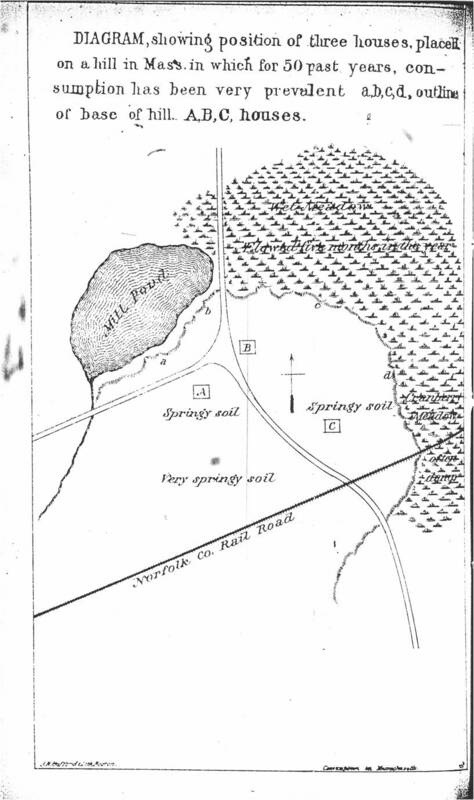 The most difficult part of this overlay of the information pertained to the “Spring” that Bowditch had identified at the southwest corner of the marshlands. On the aerial photo, there is a stream that was used to define the location of that spring. (The spring could have been a little further south and west, at the edge of the tree line and grassy space.) Next, the southernmost edge of this moist area was reshaped to match that single criterion. Based on surface features in and around this former moist area setting in the aerial photos, the northern edge of this moist terrain was spread a little further northward, appearing to extend beyond Bowditch’s rendering of this same land feature. Bowditch’s depiction of this area may have true borders, or Bowditch may have simply stopped indicating them since this was the northmost edge of the area we wished to illustrate. 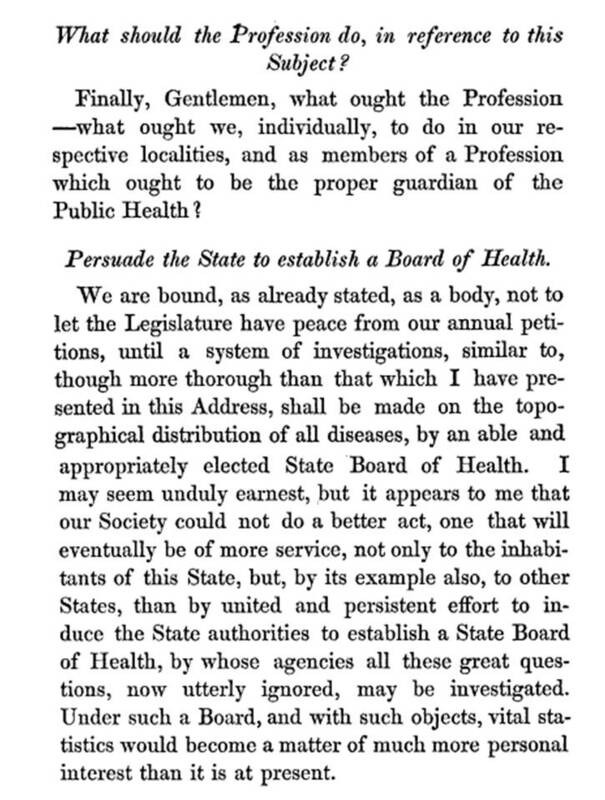 General Summary Of These Investigations, And Of, What I Deem, The Logical Inferences The , Public And The Profession Should Draw ThereFrom, WITH SOME REMARKS ON THE DUTIES OF THE STATE, Of The Public And Of The Medical Profession, In Relation To The Subject. Commencing these investigations without any thought of ever arriving at these results, but simply with a hearty faith that every sincere student of God’s laws on this planet will always find more than he can dare hope for, I have been led to, what I deem, one of the most important results of my professional studies. First. Consumption is not equally distributed over New England. Second. Its greater or less prevalence depends very much upon the characteristics of the soil on, or near which the patients affected with it have resided. Third. Moisture of the soil is the only known characteristic that, so far as our present investigations have gone, is connected with the consumption breeding districts. Fourth. An attention to this law in the development of consumption in New England (now first, nearly, if not quite, proved to be true, by the analysis of the data which your courtesy has afforded me), I have found of great advantage in my professional practice. To the first three propositions, I have given you, I hope, sufficient evidence to command your close attention hereafter, in your various circuits of practice, even if they do not immediately gain your implicit belief. To the last proposition you, of course, will give just that amount of credence you think due to my judgment and my integrity. So what does all of this tell us? Blaming the soil for disease is a very old adage in medicine. There were hints of this as early as 1800 when one of the earliest writings about the cause for cholera made mention of the alkaline soils as a cause, basing this conclusion on the fact that many locations where this epidemic seemed to prevail bore calcium rich limestone. (This theory was in fact true; the organism responsible for cholera, vibrio, likes alkaline waters.). When we review many of the medical topography articles published during the period from 1800 to 1850, we find there to be a repeated emphasis on alkalinity, rock type and disease, often accompanied by a close look at mineral springs and the chemical nature of waters for a given region. The intent often was to find mineral springs that were considered healthy to the body and the healing process, but often the purgative nature of some of these waters was also important; their related sulfur and toxic and biting alkaline nature made many of them not consumable, and some outright poisonous to both people and livestock. A medical geographer for this time would be right if he asked: Could these very toxic waters be the cause for disease, even when found in lower concentrations of toxicity? Water and soil had a special chemistry to them. Some of the physicians who focused on geology and disease included soil as a part of their physical geology observations. Soil was after all considered a by-product of underlying rock structures to some extent, mixed with detritus and other possible pathogens or disease carriers like effluvia or the chemicals needed to produce a new form of the phlogiston, an element (atomlike, smaller than a pure chemical substance) that interfered with oxygen, and supressed the life vital force. From 1800 to about 1820, and perhaps even to 1830, a New York medical writer specializing in natural history, Dr. Samuel Mitchell (covered as well in a separate section in this blogsite), developed his own version of the phlogiston theory, speculating that there was this as of yet undiscovered element that the geologic contents of nature formed when allowed to react with the detritus and other organic substances. This reaction resulted in the as of yet unnamed element, which he referred to as phlogiston. Its chemistry seemed to have an influence upon people like Bowditch. Bowditch was too experienced in the past politics of this part of the medical philosophy to allow theories like phlogiston to become a part of his philosophy of disease development. No new elements were the cause for disease, but there was thisd unique feature of soil that allowed for interactions to take place. The ability of soil to hold and store air was the main component of the soil based philosophies of disease by medical geographers following in Bowditch’s footsteps. Throughout the cholera years of Bowditch’s early professional years, physicians published all of their various theories as to the local causes for cholera. These included the ability of rocks to effervesce, the ability of detritus to interact with metals, the ability of soil to dissolve, swell, or change color, but no one looked at soil as if it were simply a storage receptacle, a sponge in which the various elements of nature could rest, and with time evolve and react with each other, in just the right soil types, to form the new effluvium and chemistry needed to cease the life of some unsuspecting person. Soil was not the cause for disease due to God’s intent, it was a result of nature. Its methods of generation and efficiency of taking a life were a consequence of human and personal family character, heredity, and physical nature. We could adapt to some regions is what Bowditch was suggesting, but not to each and every kind of region that was out there for us to build a home next to. Consumption ridden areas are places where man could not adapt to the climate and the physical geography as it was defined by its soil base. The Darwinian model for evolution, prevailing and most popular by 1860, gave very good reasons why we could not adapt to these conditions. Darwin’s model also states that we become extinct whenever we cannot adapt, as nature dictated. If we misbehave in certain parts of the natural world, we suffered due that misbehavior, not as a consequence of any of our “sins” like “the Book” suggests, but a direct consequence of our own beahviros and choices that were made. We could never adapt to surviving in some of the most pathogenic places. Families unable to accept this fact would simply be removed from the others making up this very local human population, unless they were smart enough not to try to live in such a dismal unhealthy place. Latitude differences between Rhode Island and West Newbury. Bowditch tested areas above and below the state, demonstrating minimal influence of latitute and latitude related climate in the locations for consumption. Proximity to water and specific soils was more important. 2. He was against the encouragement of migrations towards the south. 3. The Irish were very susceptible (p. 29). 4. Certain houses can become foci (p. 38). 3. Establishment of Sanitariums along the ocean front. Whether this is really a correct explanation or not I am certain that in many cases of early phthisis the tonic clear soft air of the Isles of Shoals in summer has been of immense service. Two patients spent the winter there In one patient a crackling throughout the whole of one breast disappeared which I fear it would not have done had the patient remained in Boston. The winds were violent but the temperature was less severe than in corresponding places on the shore. These winds will however always prevent many from residing at the Shoals during the winter unless per chance the inherent healthfulness of the situation and the superb marine views that one can enjoy there should in some future time cause a Sanatarium to be erected properly constructed to obviate at least in part these difficulties. [matching footnote] It is part of my medical faith that within fifty years our community will occupy this and its kindred islands as places peculiarly fitted for many of our citizens who prefer to remain near home to seeking health further south They will be in some measure to New England what the Isle of Wight is to Great Britain although the beauties of the two places will be forever very different and the climate of the Shoals less gracious than that of the mild almost tropical airs of Undercliff or that of the islands of Nantucket Martha’s Vineyard on our own shores which experience some of the genial influences of the Gulf Stream. 4. Request for new State Public Health Department Officer. Once the Civil War ended, American medicine went back to its unique methods of defining and interpreting disease patterns. The trends for the time with defining the cause for disease were even more numerous after the war than during the years before the war. The addition of the various ways in which geography could be used to define the cause for disease enabled scientists to come up with as many ideas as to the cause for disease in the outdoors as there were creative minds. So the numbers of disease theories that existed became more numerous as new discoveries and interpretations of the natural setting were developed. The ability of scientists to look further and further at the details of nature within the setting that disease evolved and prevailed made it possible for every branch of the natural sciences or earth sciences to develop its own philosophy as to the cause for disease. Even the astronomical sciences played an important role in this aspect of the medical practice. This natural science approach to defining disease enabled physicians with a strong background in some field of science other than physiology or medicine to come up with his or her own theory on the cause for a given condition found to be geographically limited. There was no limits to the imagination during this period of medical history, no limits to the discovery of new elements of nature, and new non-theological causes. Some of the professions reactivited once the War of the Union was over were climate therapy, water therapy, the use of mineral springs, homeopathy and its rival companion against allopathy Eclecticism. Some fairly detailed sciences were developing as well by now and trying to define disease, ranging from agriculture, farming, and zoology for the zoonotic disease and geology, minerology, hydrology and pedology for the abiotic diseases. With improvements in the understanding of chemistry during the mid and late 1800s,a more detailed understanding of the chemical reaction processes ensued leading to yet new chemical theories for diseases. The theoretical “miasma” was explained as some form of invisible gas or vapor associated with the new types of chemical processes they learned could take place between rocks, gems and soil. By the 1860s this common requirement was accompanied by a need to document barometric pressure, temperature, humidity and windflow readings on a daily basis, sometimes multiply per day, practices which became a requirement by state and regional societies. By engaging in the collection of this data needed for the annual reviews of the state’s disease geography, some officials became experts in this particular part of their field. Disease prone regions were given a new and unique series of arguments for what the local “miasma” could be, or how it could change from a non-infectious state of effluvium to an infectious and sometimes highly transmittable contagion. Helping to set the stage for this was the work of Bavarian chemist and hygienist Max Joseph von Pettenkofer (1818-1901, prime years of publication 1877-1882). Pettenkofer was very much into the relationship of soil chemistry and form to health and hygiene. Trained in medicine, pharmacy and chemistry, he quickly became known as a hygienist due to his philosophy regarding disease. One of the popular topics for this time pertaining to sanitation was the proper practice of sewage disposal. This in particular was of interest to Pettenkofer due to the possibility that certain chemical events could be taking place quite deep beneath the earth’s surface, enough to produce gases of various forms, the chemistry, behavior and flows of which through the substratum were defined by soil type. In other words, there were some soils that were known to have a lot of air space in which gases could be trapped, whereas other lacked this air space and did not become infectious. In addition pedologists were learning that some soils had particles capable of expanding due to climate, temperature, humidity and local water related changes. Between each soil particle there is a small gap in which chemical reactions can occur. It was in these spaces or gaps, found to be larger in certain soils types, and more capable of reacting and forming gas based on the soil content and chemistry, that Pettenkofer was sure that the ability of this place to hold gas, store water and produce the miasma needed for disease development played a key role in defining where the chemical reactions needed to produce the gases and the new contagious substance could take place. Based on this theory, he argued that it was the ability of the soil to release this gaseous material back into the air, that resulted in a bad air responsible for some diseases. Now, air, soil, water and minerals alone were not able to do this on their own. By adding vegetable matter to this scenario, you have a more rapid development of these effluvia or disease-producing products of nature. In soils of certain types within which, or upon which, ample amounts of contagious matter is said to develop by rotting and such, the combination of above ground and below ground chemical reactions taking place provided the scenario needed for endemic disease patterns to develop. Given the right climate, the right rainfall, the right soil type and chemistry, the right topography and decaying biological debris, you have the requirements for a disease very specific to a locality to develop. Natural sciences had now produced a very solid theory as to disease causality that was hard to argue. Whereas during first decades of the 1800s, natural history doctors like Samuel Mitchell often made humorous statements made about the breadth of knowledge needed of the natural world to understgand disease, versus others like Benjamin Rush who were trained mostly in just the medical world and way of interpreting disease, in later years the work of Pettenkofer and others made it possible for numerous physical geographic theories to erupt for disease. Most of these were published and most were able to propagate new followers. Pettenkofer’s theory for consumption suggest that some of Bowditch’s influence that could have played a role. Alternatively, Pettenkofer might have developed his soil-based theory for disease on his own. In the later years, when the bacterial theory for consumption was pretty much proven, Pettenkofer continued to refute these findings and beliefs of most doctors and scientists, coming up with his own non-bacterial theory for the cause of consumption. This theory relied upon a third unidentified component often referred to as the z-factor, something unique to humans. The x and y factors were a particular soil type and presence of “the germ.” But according to Pettenkofer the germ was not the cause for disease. This human component was the cause and had yet to be identified. Pettenkofer’s theory pretty much sounds like a re-rendering New York Medical geographer Samuel Mitchell’s revival of the phlogiston theory taking place around 1800. Mitchell blamed disease on a theoretical unknown element in nature, which he referred to as a new sort of phlogiston that would soon be defined thanks to the new atomic theory of chemistry that was being published. Pettenkofer’s new phlogiston was a direct consequence of Koch’s new discoveries of the bacterium and disease. This demonstrates how the theories and hypotheses that often drive medicine and science can with time simply go full circle. Pettenkofer’s version of the miasmatica theory for consumption failed to take this same route as we progressed into the twentieth century. American Congress on Tuberculosis. THIRD AND FOURTH ANNUAL SESSIONS, Held at the Hotel Majestic, in the City of New York, June 2d, 3d and 4th, 1902, in Joint Session with and under the Auspices of the Medico-Legal So-ciety of New York, and the Fourth Annual Meeting, June 10th, 1903, at the Press Club, in the City of New York. BULLETIN FOR 1902 and 1903. PUBLISHED BY THE MEDICO-LEGAL JOURNAL, 39 BROADWAY, NEW YORK. Clark Bell, Esq., 1904. Today, to find clues to disease mapping and medical geography, one has to turn to the key reference for all medical writings produced prior to 1900. The Index-Catalogue of the Surgeon’s General Office is the best source of this information. Published in 5 series, 61 volumes, covering 1880 to 1961, it is the only place where you will find anything ever wrtiten about a small part of the world, by a relatively unknown author, about some common or unique topic related to medicine. The main problem with reviewing this series is trying to second guess the terms used to define major subjects. Everything is possible in this series and there is no logic as to how a place is referred to at times, or a specific article or author that you are in search of could be listed in this book (and believe me, if anything was ever written on medicine, no matter how local, unrelated or minute the topic appears to be with medicine, it is probably in this series). On the average there are between 500 and750 pages in each of these volumes of this set. Each has anywhere from 120 to 200 articles on a page depending on the font size. Book title fonts are larger, about 10 or 11 in modern day measurements; the fonts for a journal or periodical are around 6 or 7. A single page will have up a few hundred citations if the entire page consists of just periodical titles and the main topic stays the same. Finally, another problem with this series is that most items included in it are not cited repeatedly under different headings. 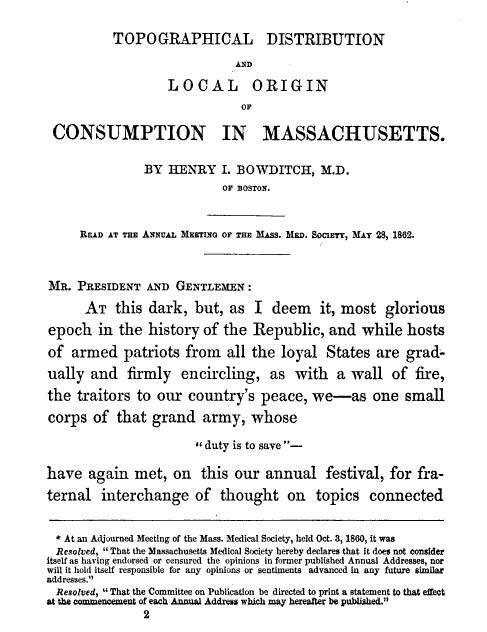 In other words, if I wanted all of Bowditch’s writings, I would have to look up Bowditch, along with Massachusetts and its sub-categories, Massachusetts (State of), Massachusetts Medical Association, Massachusetts State Board or Society, Consumption, Soil, Weather, Water (each of which have dozens of subcategories), and the names of specific groups or places associated with his work, such as the places in Rhode Island that this work focused on briefly, or the works of some of the associates cited by his works. A single disease like cholera has over a hundred pages with citations, dozens of main and subtopics, tens of thousands of articles for review, none with duplicated titles. 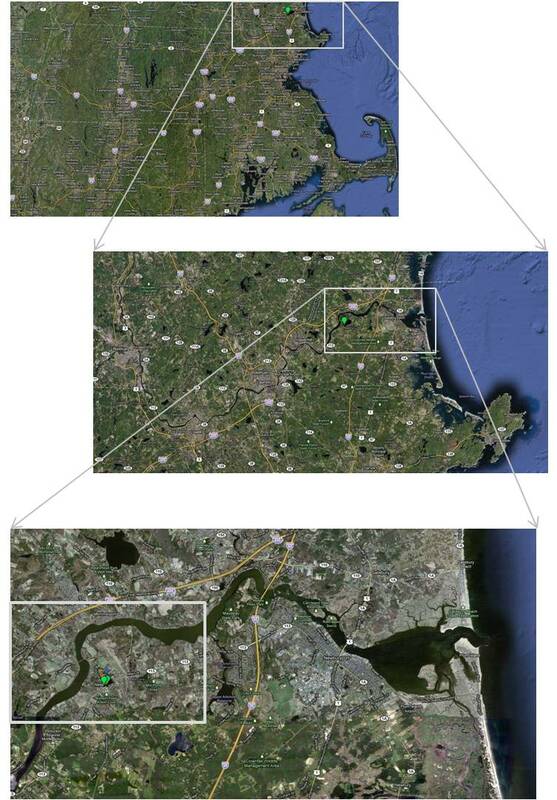 Some mid-sized urban settings had outer sections which later lost their location specific name and therefore could not be found on the contemporary Google map program available on the web. These missing places formed a very short list and included North Bridgewater, East Randolph, South Reading, and South Scituate. 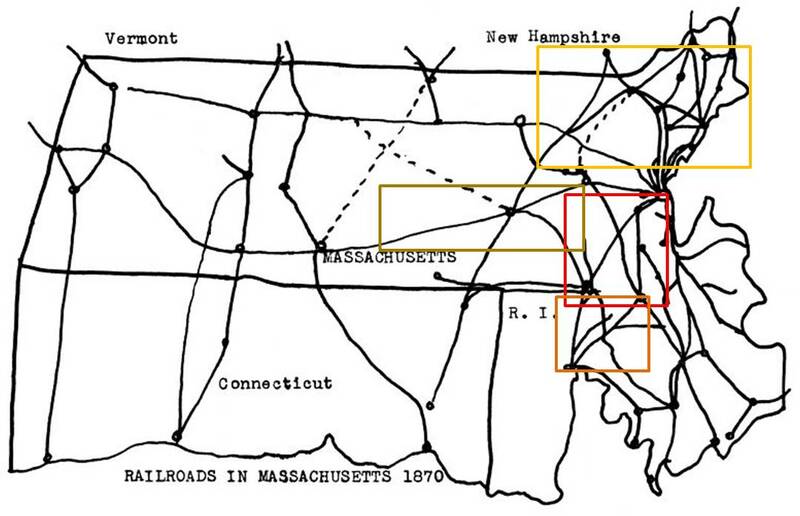 In some cases, the people-economic centers for these former places could not be identified with certainty using the modern map; for example we know South Scituate is south of Scituate, but due to the roadways pattern, exactly where to the south could not be defined. 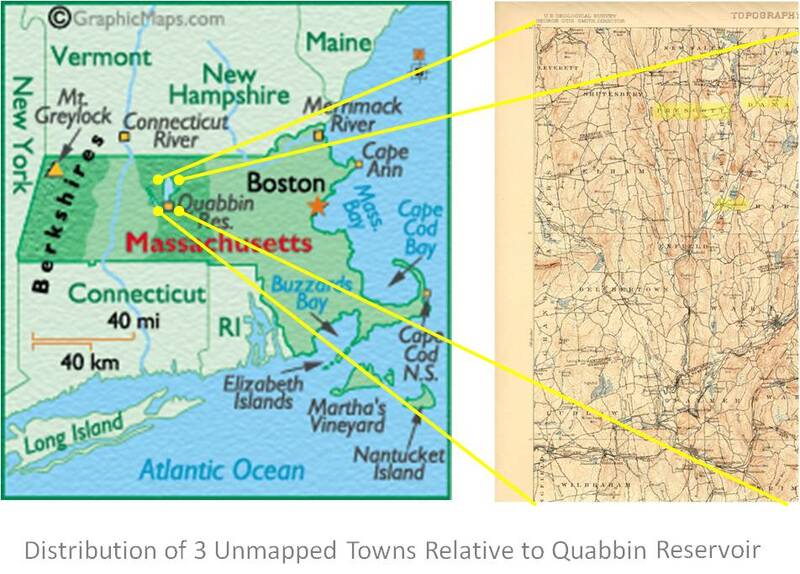 This left only 3 place names that could not be located at all–Dana, Greenwich and Prescott. All three were lost to history in April 1938 due to the formation of the Quabbin reservoir near the Prescott Pensinsula (for more on Dana see http://www.archive.org/details/vitalrecordsofda00dana, and http://www.westfordcomp.com/quabbin/dana.html). 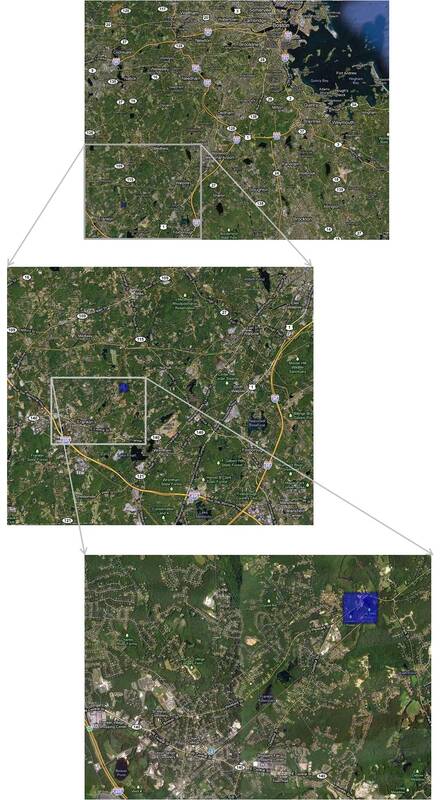 Prescott was located between the mapped towns of Pelham and New Salem. Greenwich further south of Dana and Prescott. (see http://en.wikipedia.org/wiki/Greenwich,_Massachusetts , and http://capecodhistory.us/Mass1890/Greenwich1890.htm). Born in Marblehead, Massachusetts in 1728, Edward Augustus Holyoke was the son of the Reverend Edward Holyoke, who served as President of Harvard College from 1737 to 1769. The younger Edward entered the college at the age of 14 and graduated in the class of 1746. After a short period teaching in Lexington and Roxbury, Holyoke moved to Ipswich to study medicine under a physician, Colonel Thomas Perry. After a two-year apprenticeship, Holyoke opened his own medical practice in Salem in 1749. He retired in 1821, 73 years later. Holyoke was a pioneer in the treatment and prevention of smallpox. During an epidemic in Salem in 1777, Holyoke allowed himself to be innoculated by Dr. Nathaniel Perkins of Boston. Surviving the controversial treatment, he convinced more than 600 of his patients to be innoculated. Harvard awarded Edward August Holyoke an honorary M.D. degree in 1783, this being the first award of an MD at the university. In the late 1780s, Holyoke was a founder of the American Academy of Arts and Sciences, and he served as its president from 1814 to 1820. He was also a founder of the Massachusetts Medical Society and served as its president from 1782 to 1784 and 1786 to 1788. Holyoke died in 1829 at age 100. He is commonly referred to as Dr. Holyoke in order to distinguish him from his father, President Holyoke. See also Edward Augustus Holyoke, John Holyoke, Mary Holyoke, Margaret Holyoke, Susanna Holyoke Ward. The Holyoke diaries, 1709-1856: Rev. Edward Holyoke, Marblehead and Cambridge. (Salem Mass., 1911) on Google Books.